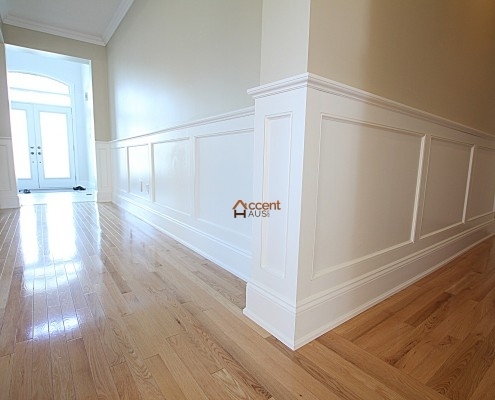 Traditional classic wainscoting generally installed from 36 to 42 inches in height on the walls from floor to chair rail. 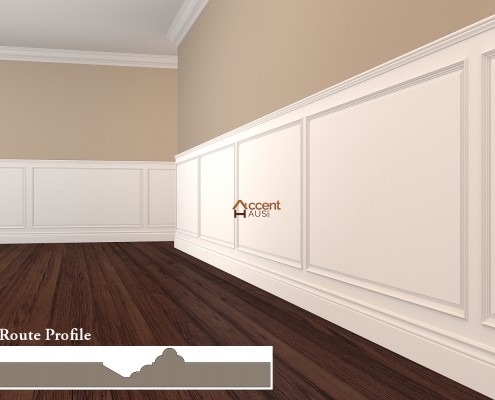 Our classic wainscoting provides elegance as well as protects your walls which are much more durable than drywall or plaster. 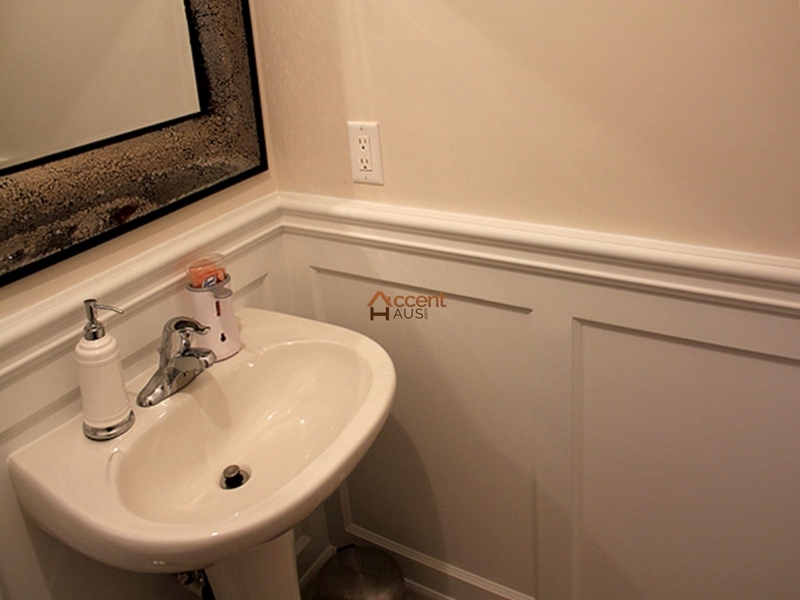 Being installed on the lower half of the wall, it also serves to protect your walls from damage. 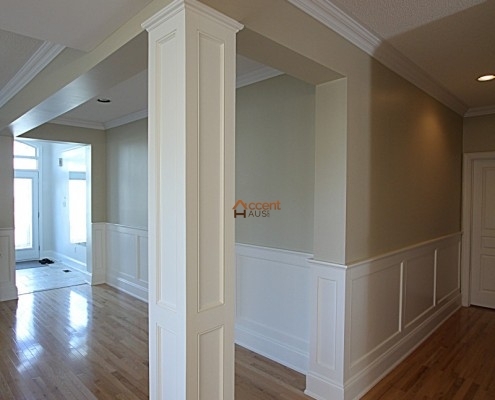 The hard woods used to construct the wainscoting stand up to wear and tear much better than drywall alone. 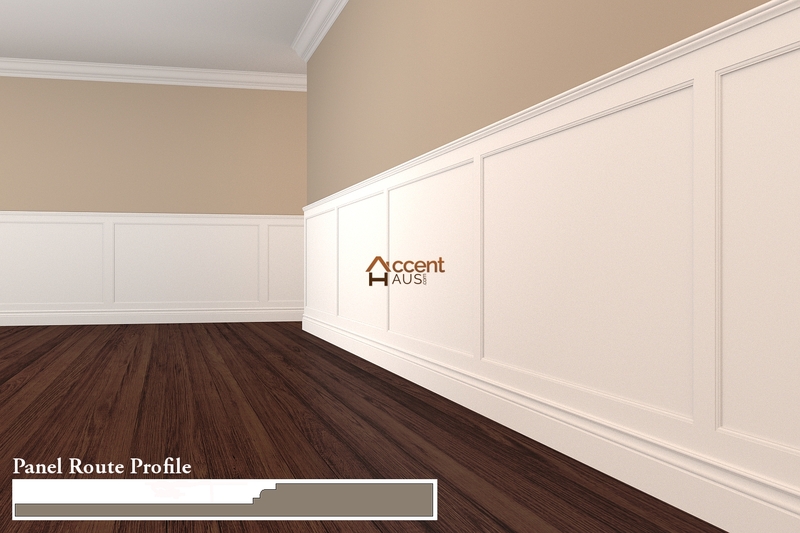 Usually classic wainscoting is painted white but our modern installations can match varieties of colors to the wall. 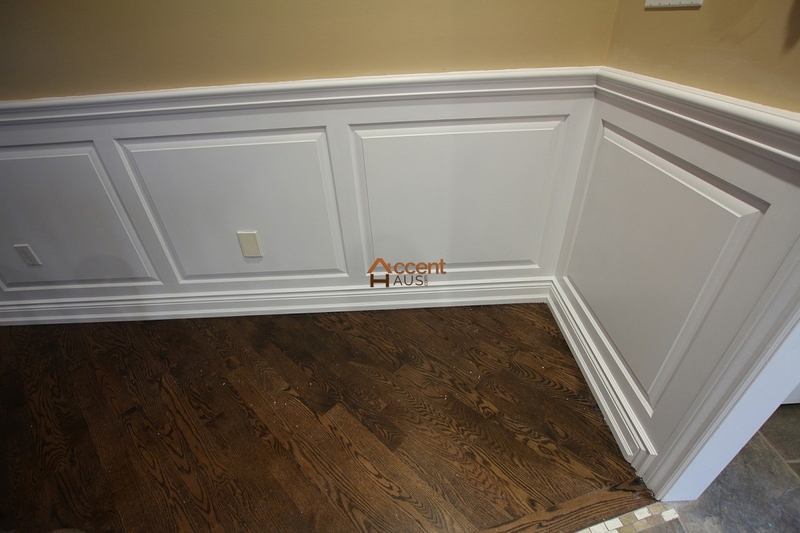 Our custom-installed classic wainscoting can be combined with various paneling and chair rails to create custom styles that will surely suitable with your budget. 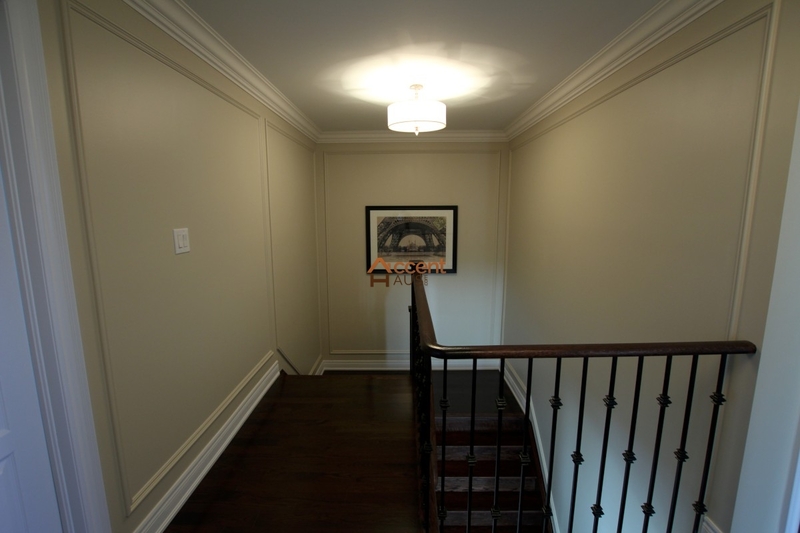 If you need some help with your design, our team of experts is always available to assist. 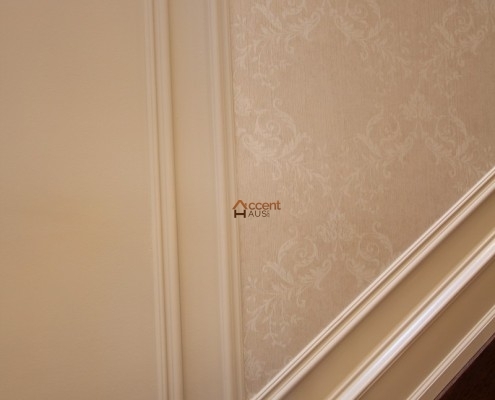 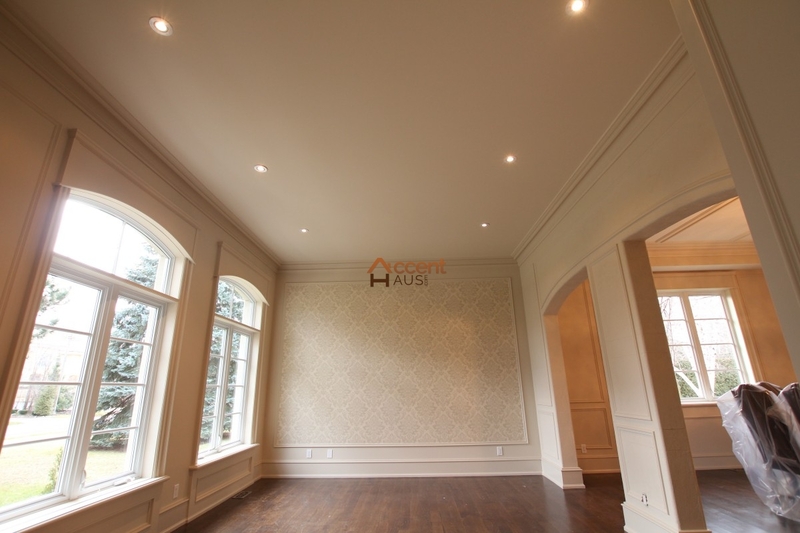 We provide accurate measurements, precise cutting and perfect installation of wainscoting decorations. 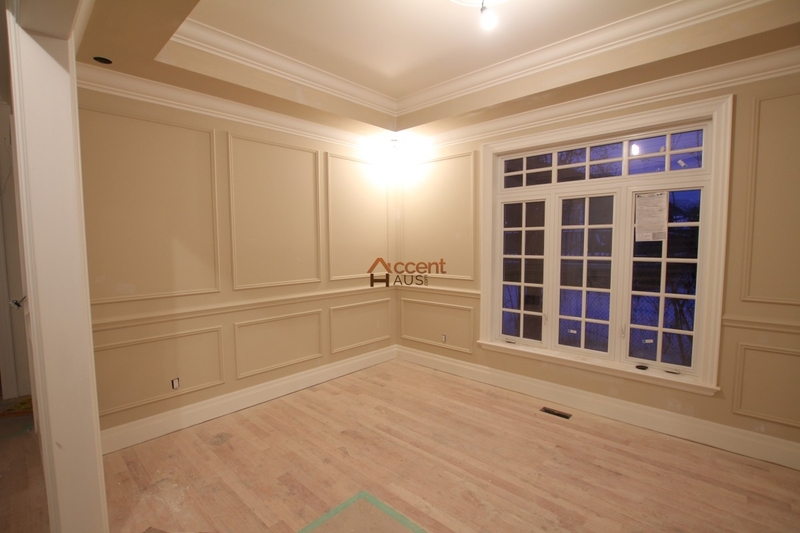 You can use the rich look of classic wainscoting as a decorative element to dramatically transform of any room at your home. 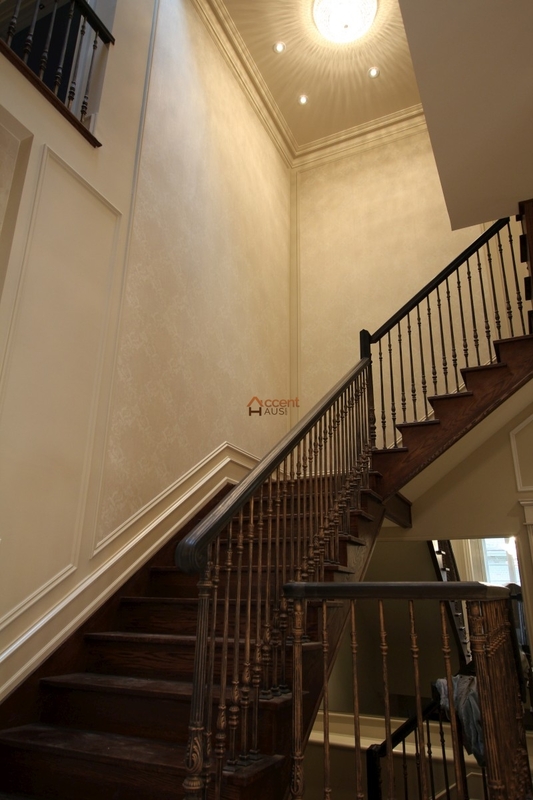 With creative design patterns, classic wainscotings can be designed from chair rail to baseboard to archive a modern look in interior decorations that gives the walls a new patterned look. 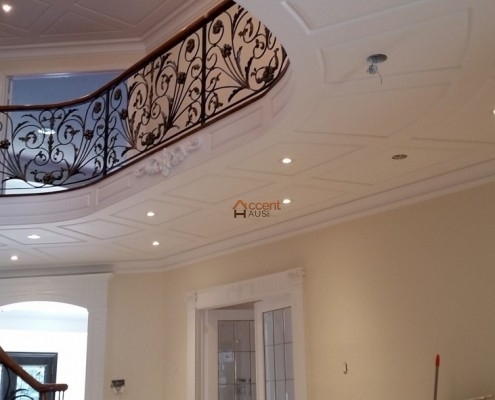 Our team of professionals will provide you detailed drawings and design ideas to simplify your home renovation projects at most suitable cost. No matter the size of your room or bathroom or the style of your home, we can customize the design of wainscoting to fit your space perfectly. 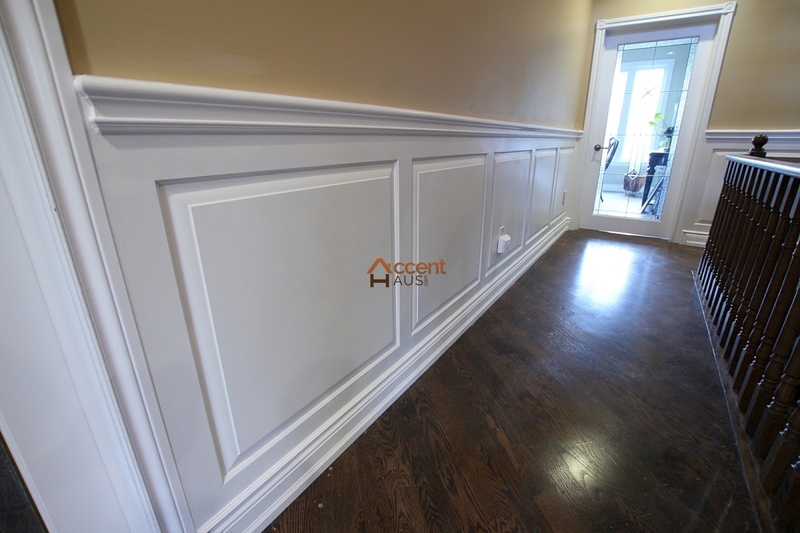 Classic wainscoting provide rich solid and classic look to your home interior. 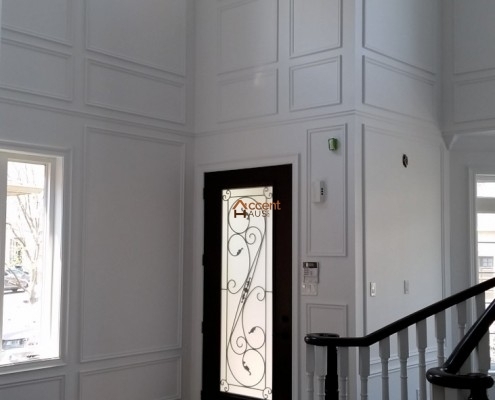 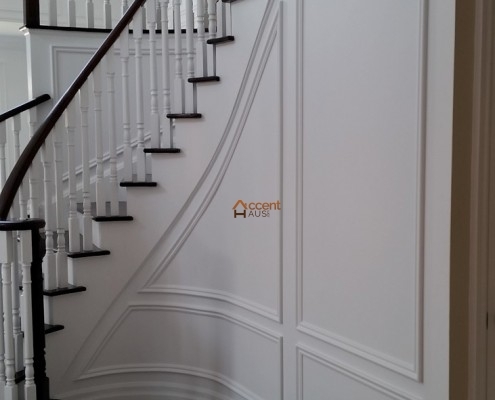 Our installed wainscoting can be combined with other paneling, chair rails and stiles to create affordable installation in various architectural styles. 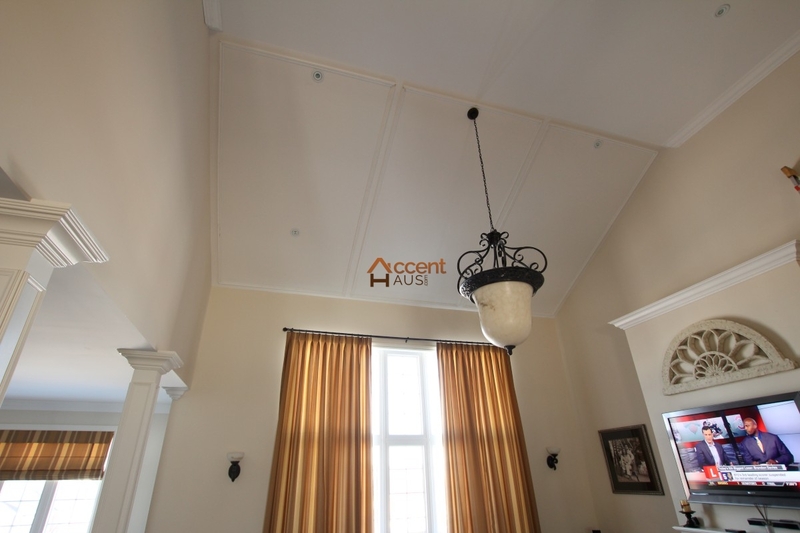 It can be installed at any height based on your requirements. 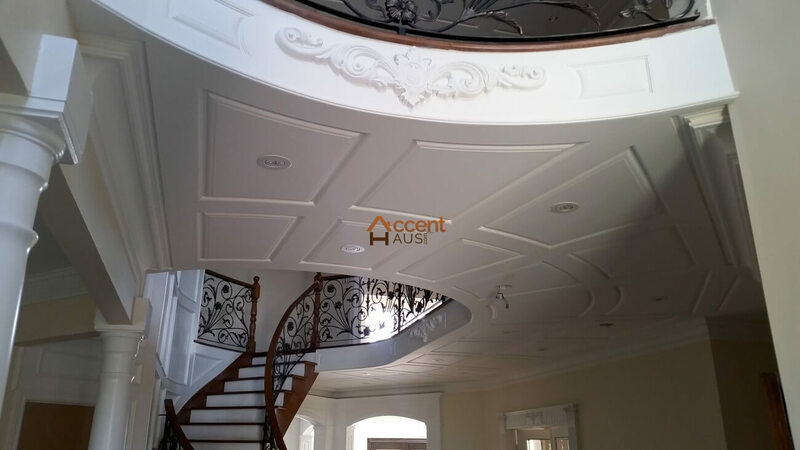 Our team of experts will assist you to choose the perfect style that can surely provide gorgeous appearance for your interior design. 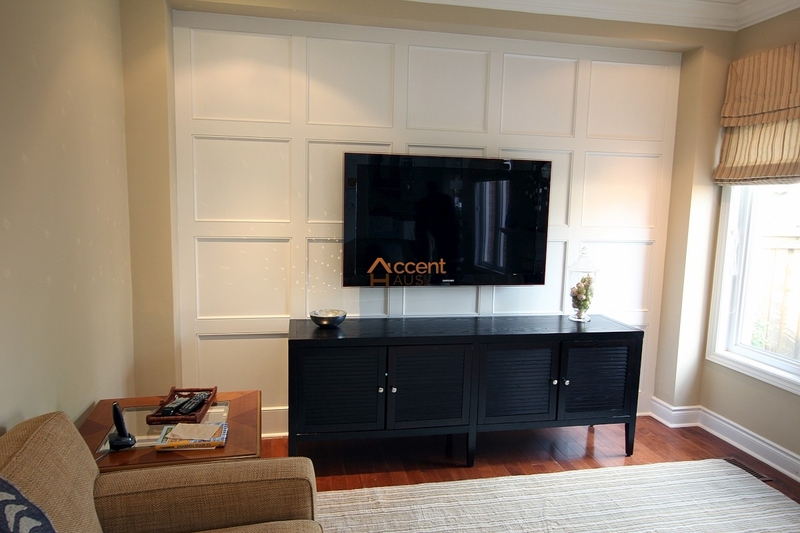 It can be easily installed with any room of your home. 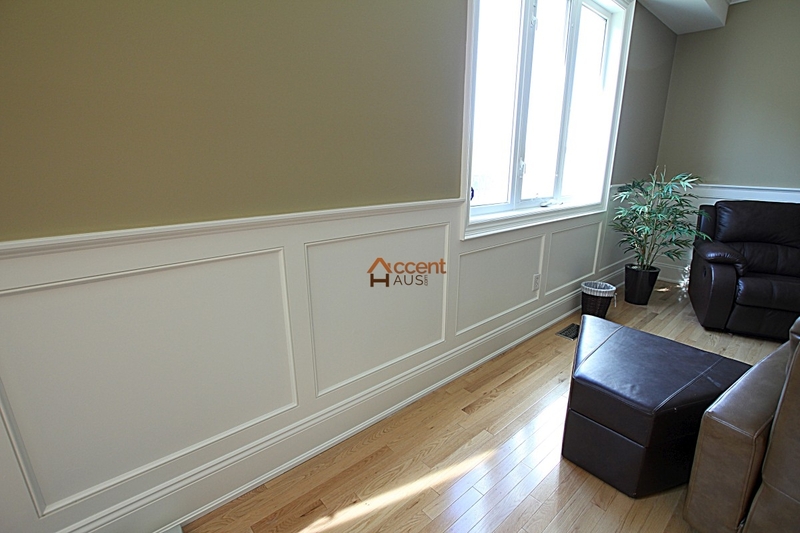 Our classic wainscoting turns an ordinary space into everyone’s favorite room in the house. 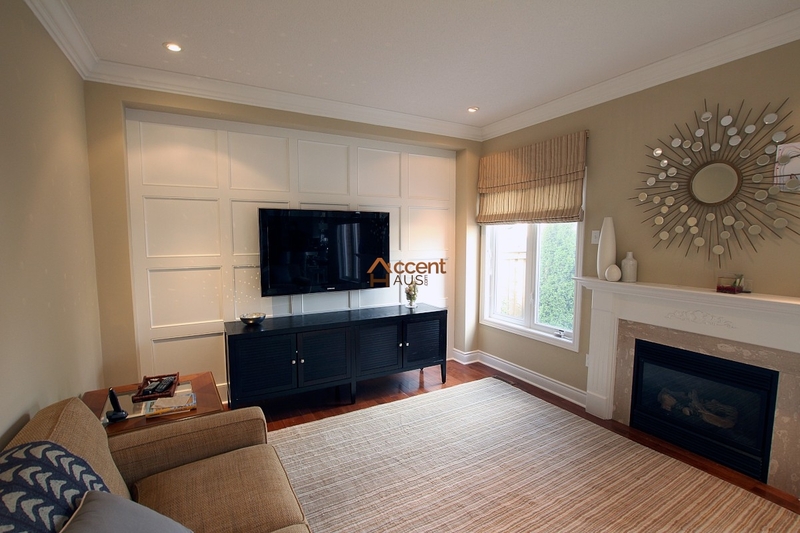 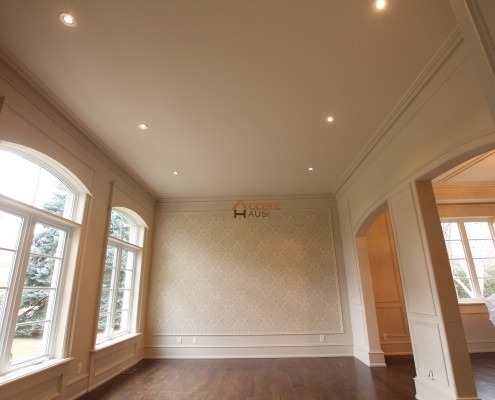 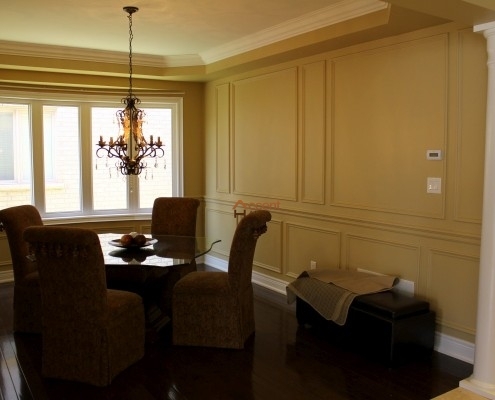 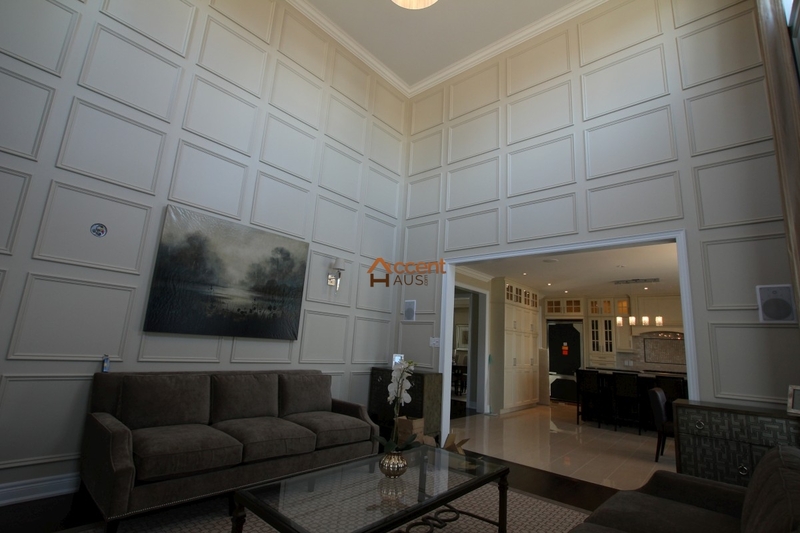 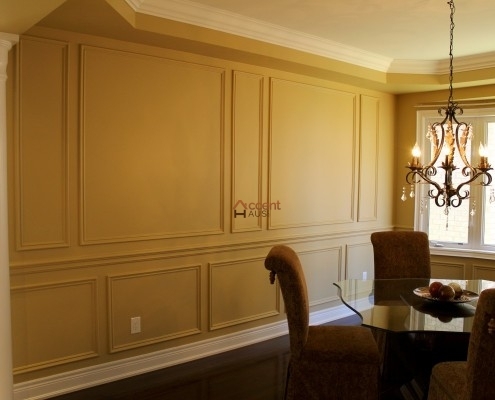 Full wall wainscoting panels provides an exceptionally rich and complete look. 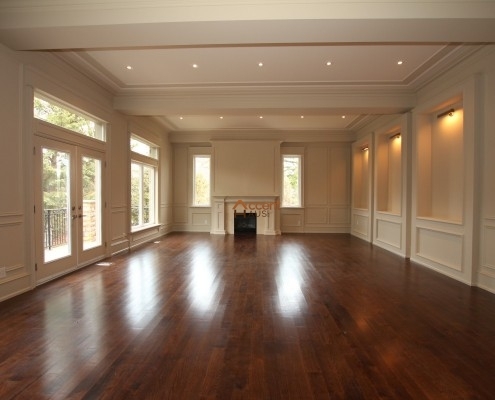 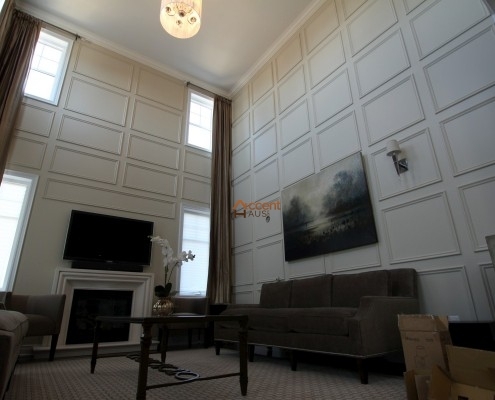 Stretching from floor to ceiling, your walls are encased entirely in elegant, classy wood paneling. Our wainscoting panels offers latest design patterns for your home interior. 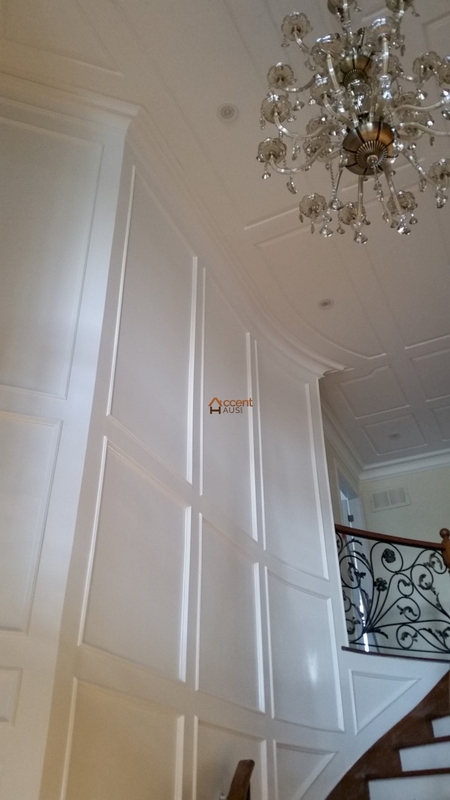 These decorations are an incredible approach to additional protection to your walls while providing a classic and attractive appearance to your home. We can customize designs to fit any room such as dining or living room or even family rooms decoration. 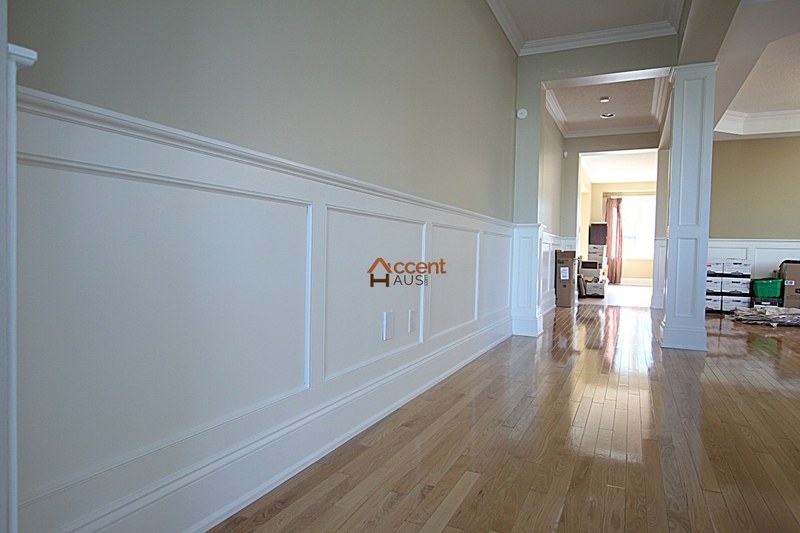 Nowadays, these wainscoting panels are getting popular and add great expansion with latest design ideas. 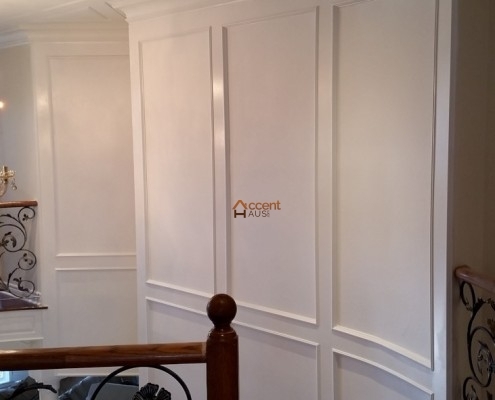 These wainscot paneling can be painted white or any other wall color. 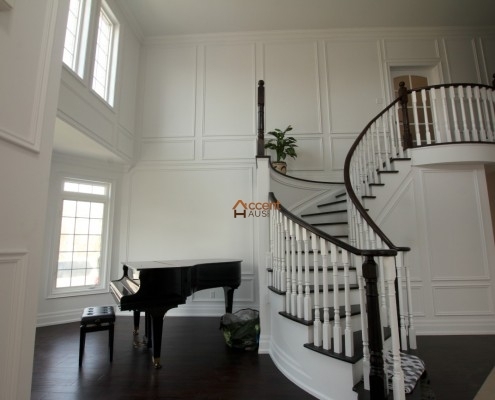 White is the traditional color however modern designs allow for a full range of creativity. 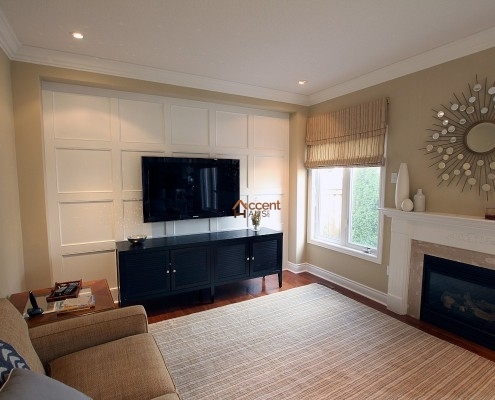 For a clean and modern look we can use a monochromatic color scheme. 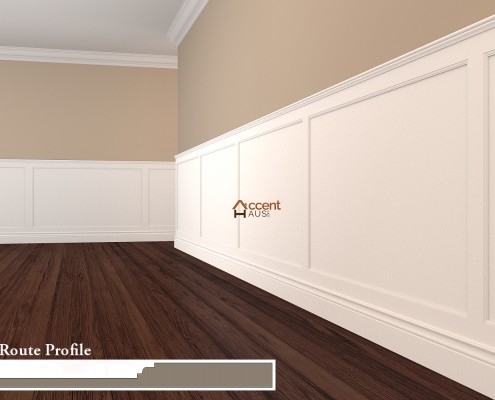 Based on your requirement we can paint elements of the wainscoting similar tones or paint all of the wainscoting one solid color that’s a shade lighter or darker than other color elements in the room. 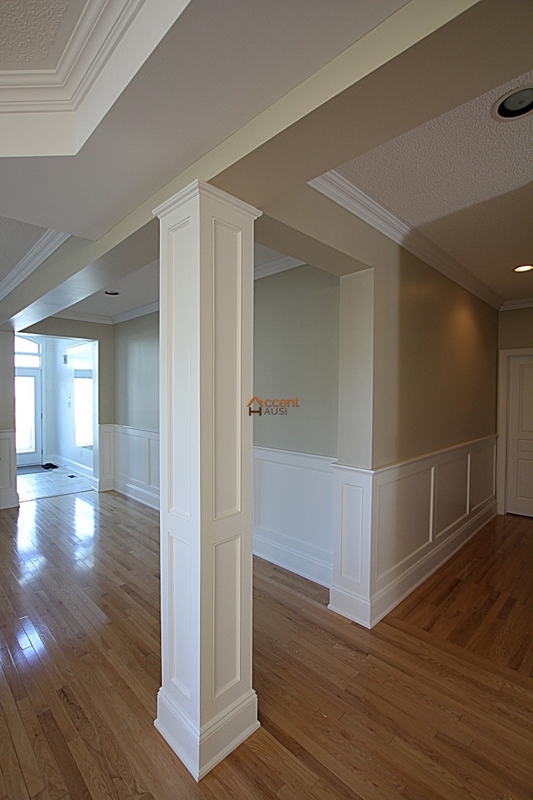 For a stronger statement we can use colors that provide greater contrast. You can of course choose any color combination that can be customized to fit your perfect design. 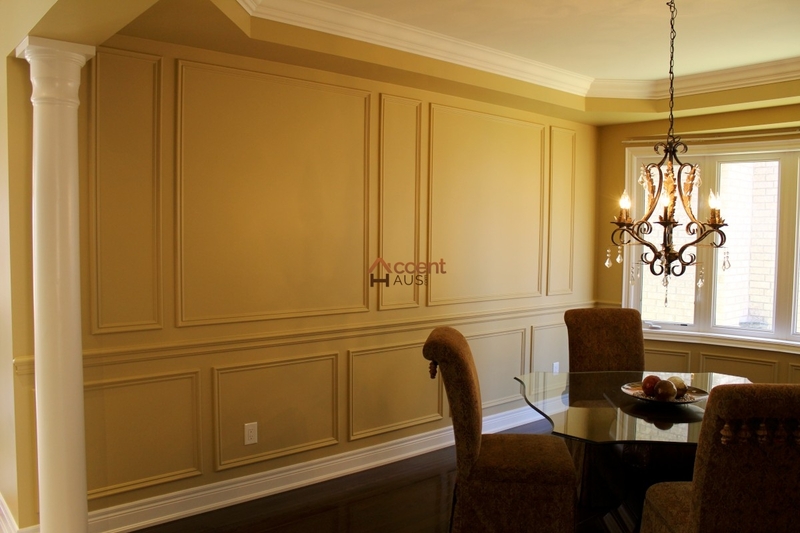 Full wall wainscoting is more than just a design element but can be an architectural feature of a home. 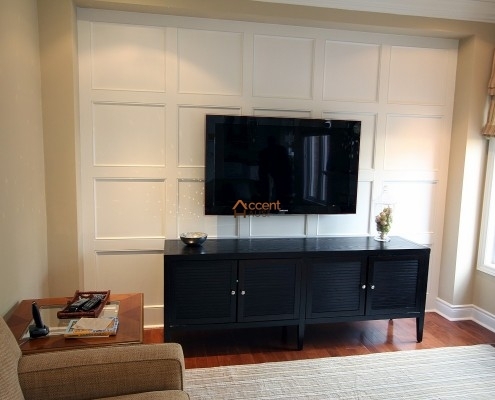 It adds texture and appeal to any space and with a wide array of panel options and can be customized to fit any design. 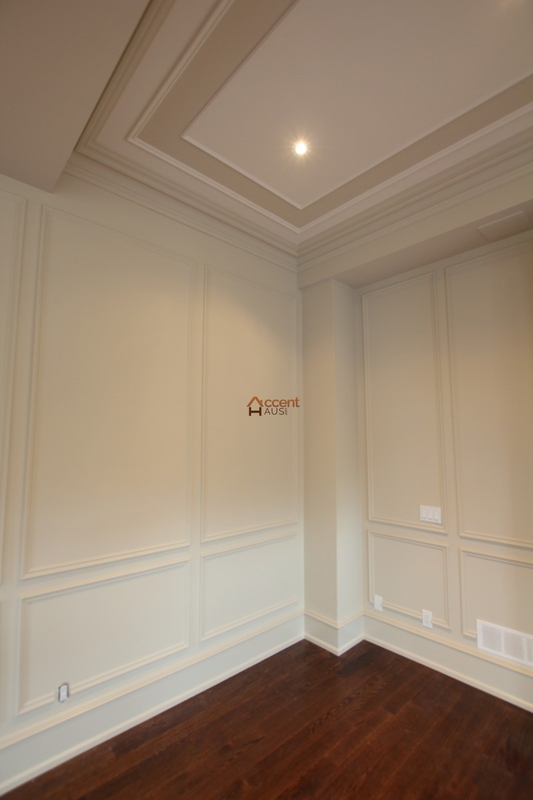 Unlike half-height wainscoting, using full wall panel provides much more latitude to enhance the architectural elements of the space. Our expert designers will work with you to customize the wainscoting to achieve the perfect look that you desire. 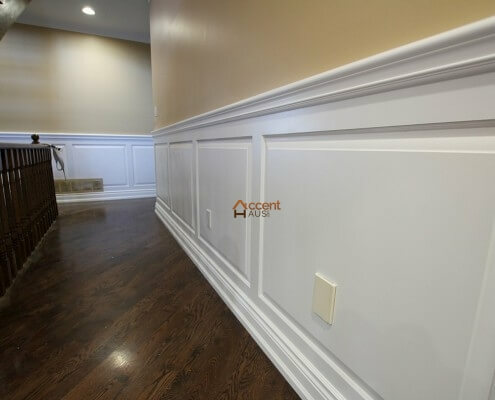 The appearance of full wall wainscoting provides an attractive look of your home interior that can transform an ordinary room to something amazing. 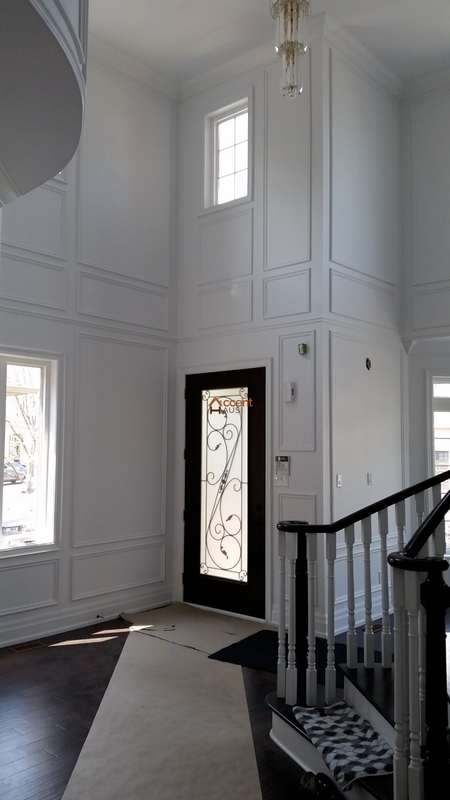 We will assist you in selecting the style, design, color of the paneling and trim to build a custom look that can be perfect for your home. 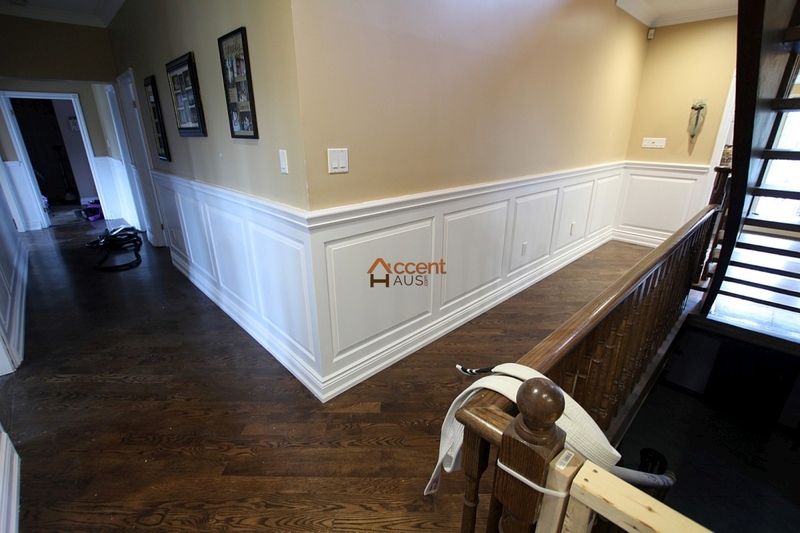 Staircase wainscoting can be installed at the classic height of 36” to 42” or can be a full wall height. 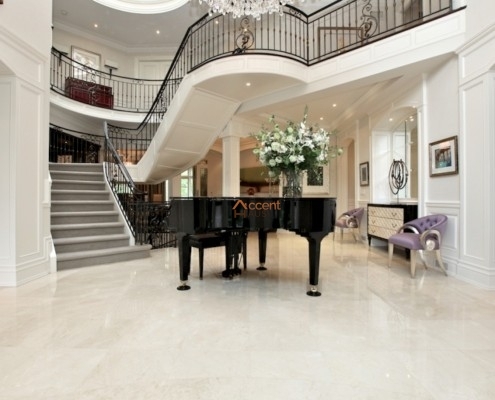 Both look classy and elegant. 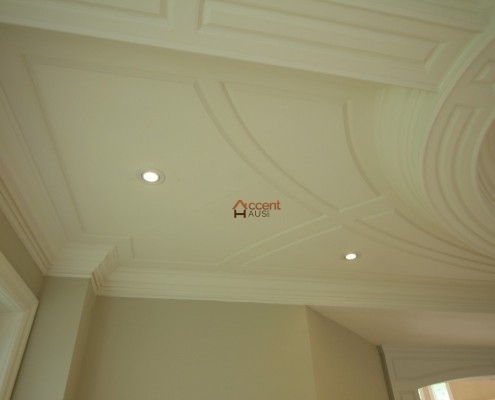 Designs can be mixed as well. 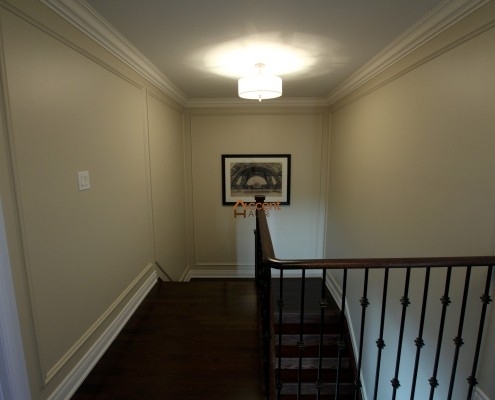 One common application is full height on the landings with classic height along the staircase in between. 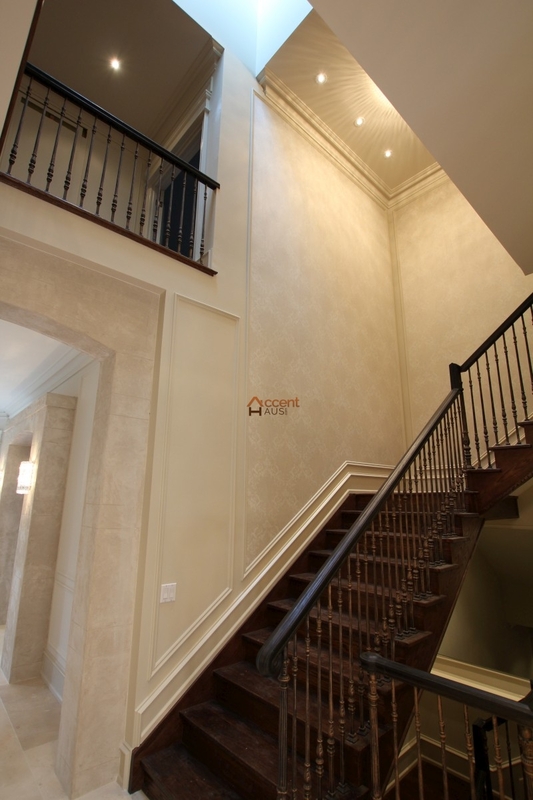 Variations in height can also be used to highlight windows or other architectural elements along your staircase. 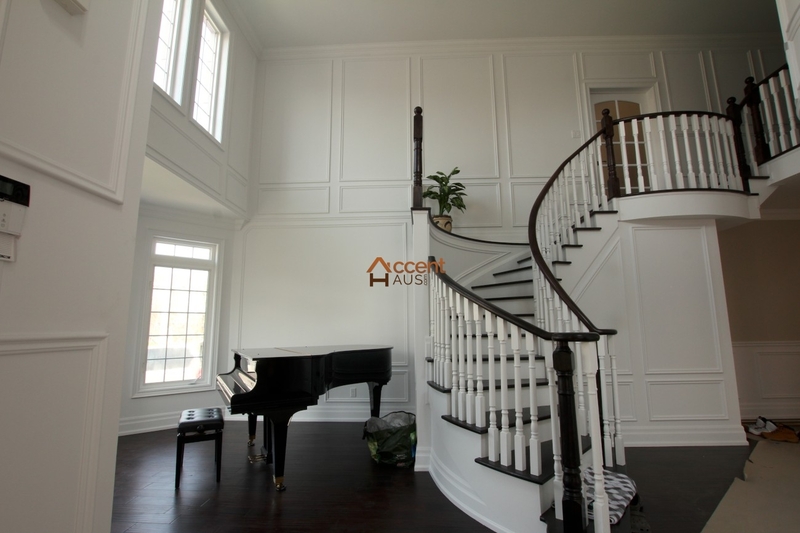 Depending on your personal style, we can decorate staircase wainscoting at classic height or full wall height with creative design ideas. 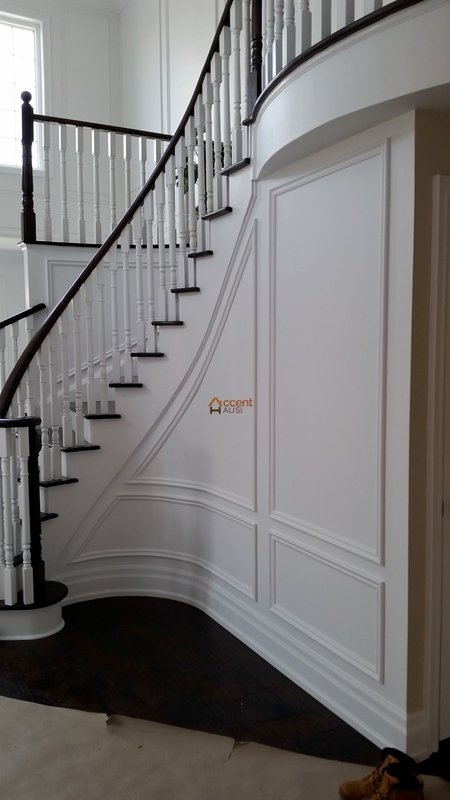 Our staircase or even curved staircase decoration can turn your home into a showpiece with wall paneled wainscoting designs. 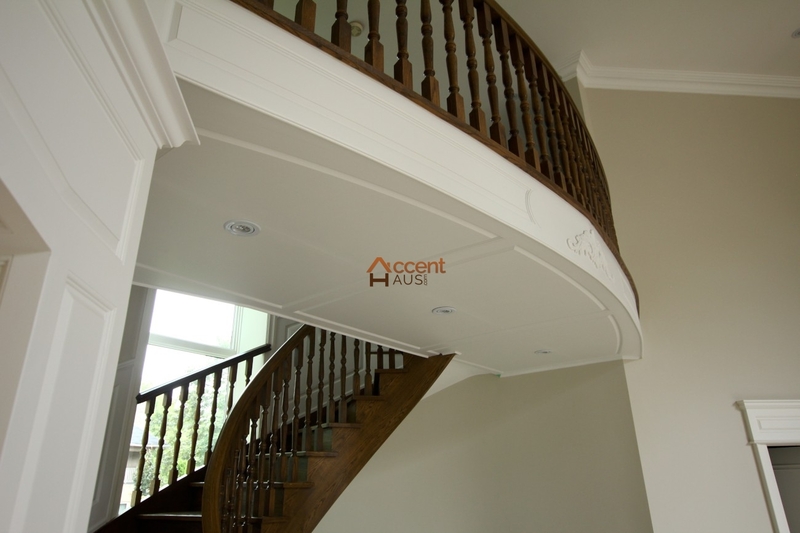 We provide the flexible base and top rails for curved stair cases which can take the shape of the walls regardless of the curve. 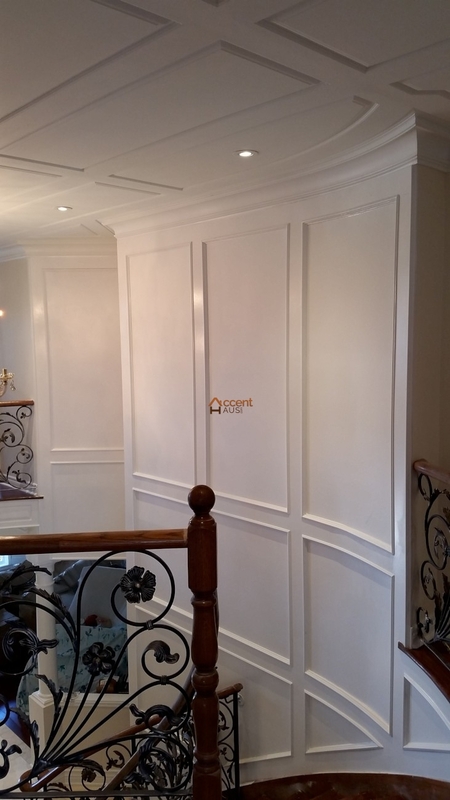 Our team of professionals will assist you in customizing designs to add raised or flat panel wainscoting to your staircase. 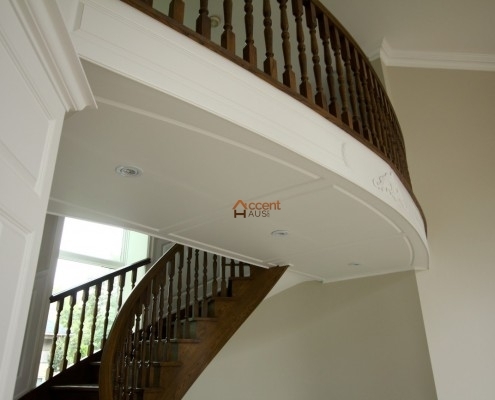 Our panelset systems are adjustable to fit any stairways. 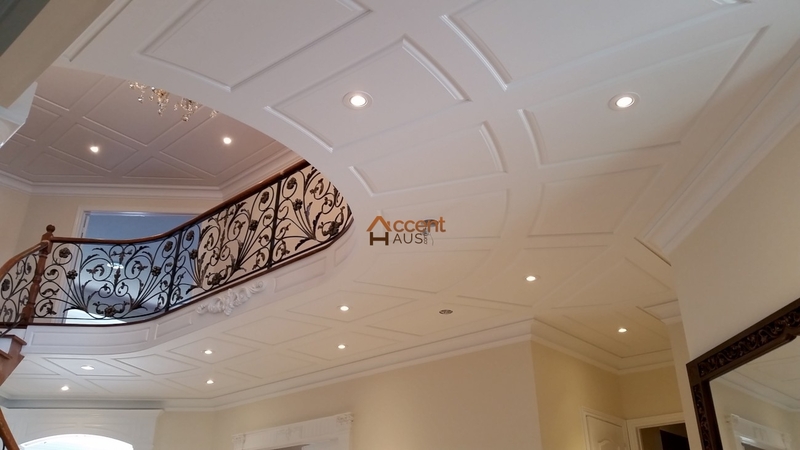 Depending on your requirement, we can provide full material list, drawing and price quotation to suit your budget. 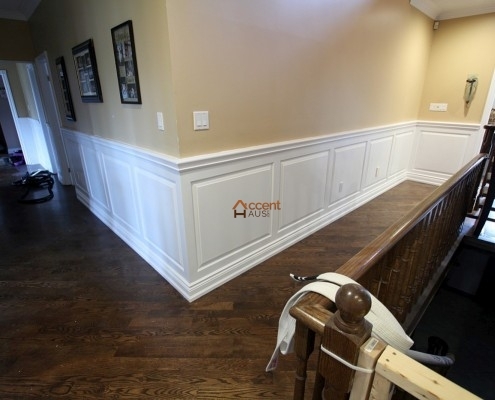 Wainscoting can also be applied to more than just the wall along the staircase. 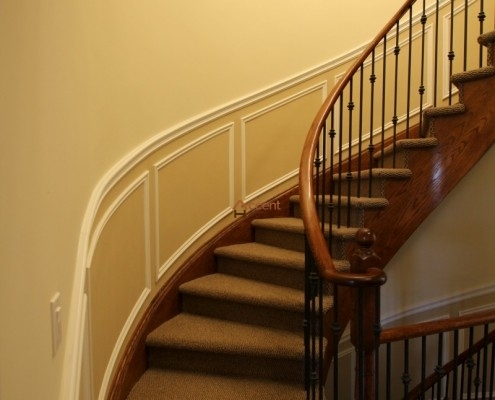 If the underside of your staircase is exposed, wainscoting can be installed there as well. 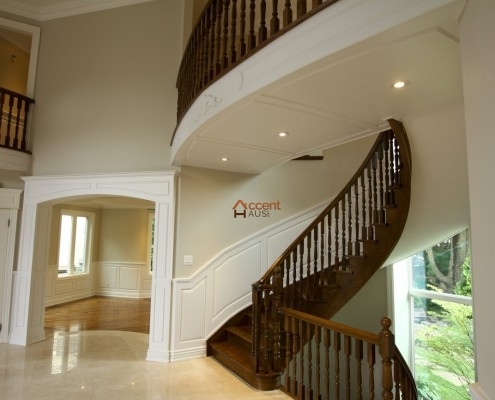 This adds an interesting design and architectural element to the staircase. 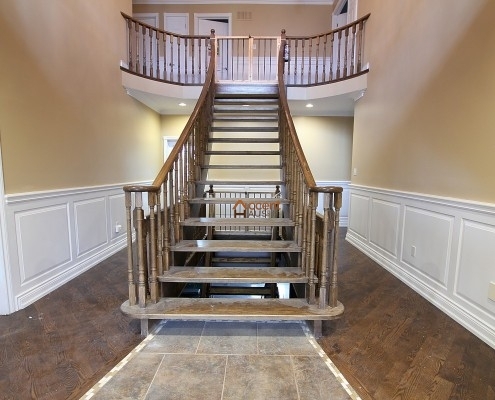 Staircases always present a unique and challenging decorating opportunity. 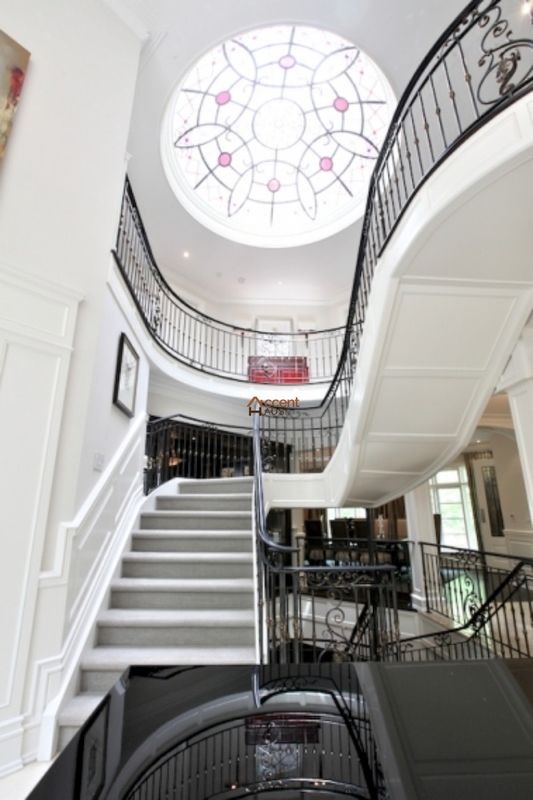 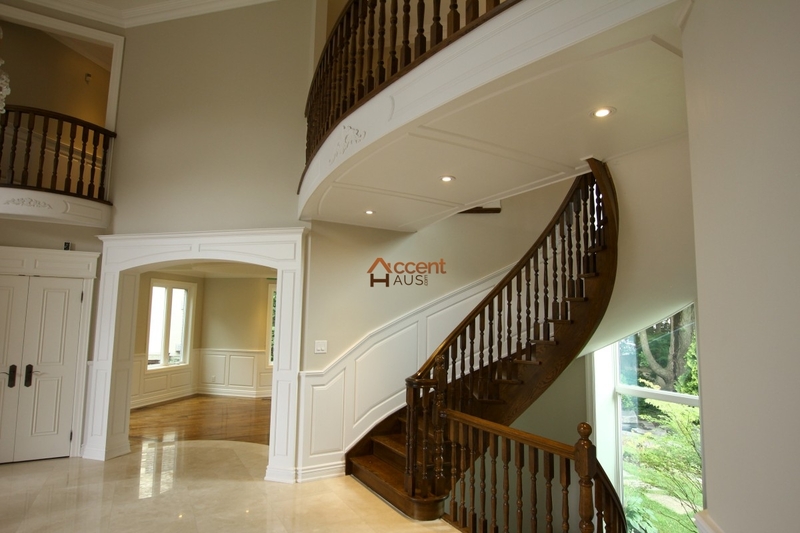 An elegant staircase on its own makes a home look incredible. 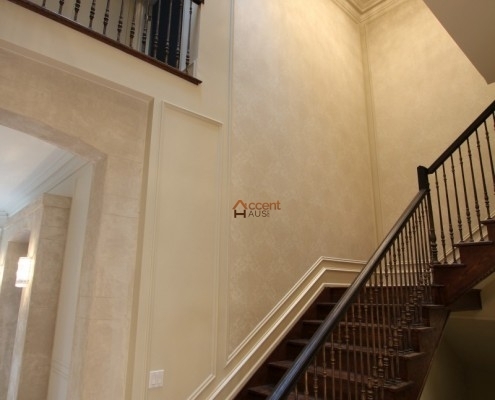 Adding wainscoting takes any staircase to an entirely new level. 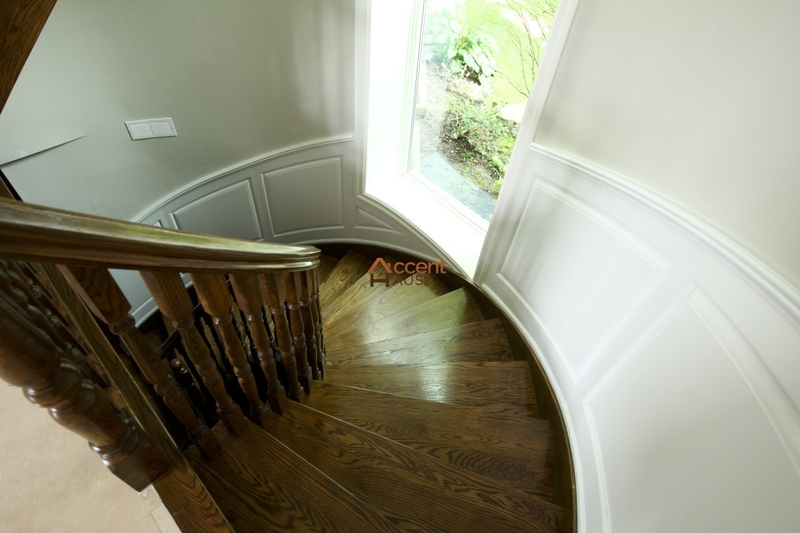 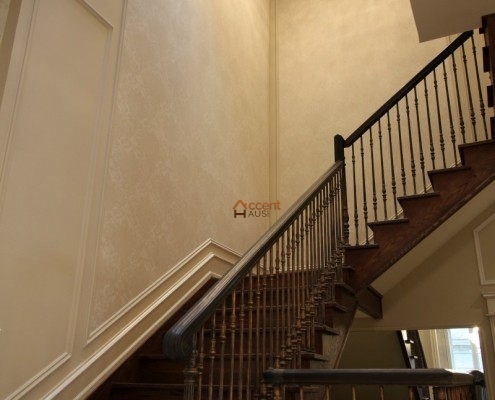 Staircase and curved staircase wainscoting adds timeless beauty and elegance to any home. 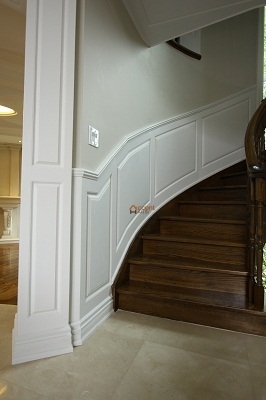 Many of the same styles that are available on our classic wainscoting can be installed along a staircase as well. 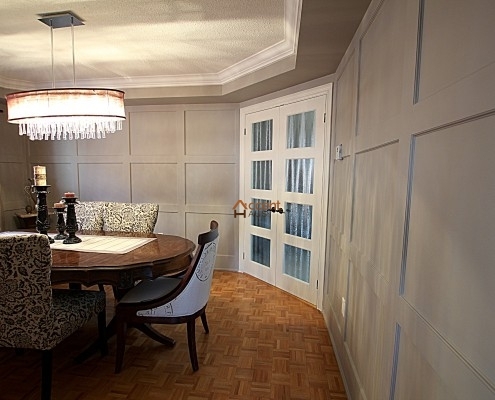 Choose from flat, raised panels, shaker, beadboard or appliqués. 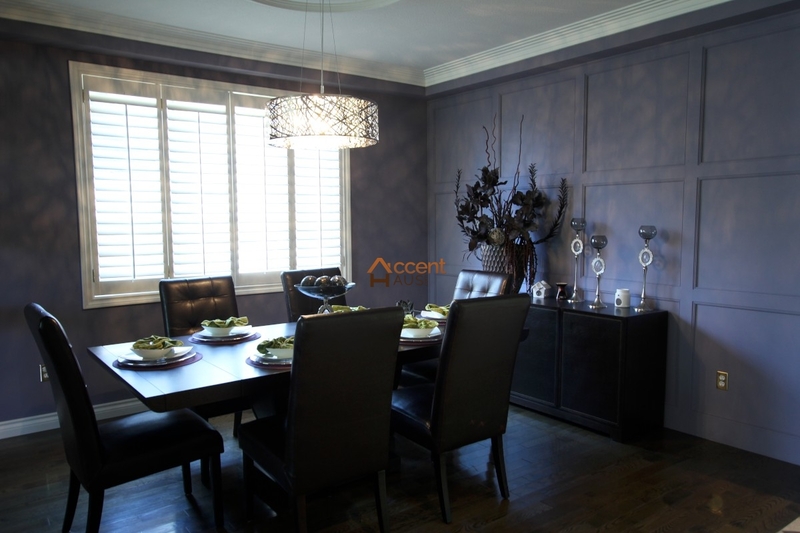 These styles, worked into our expert designs will bring beautiful elegance to your space. 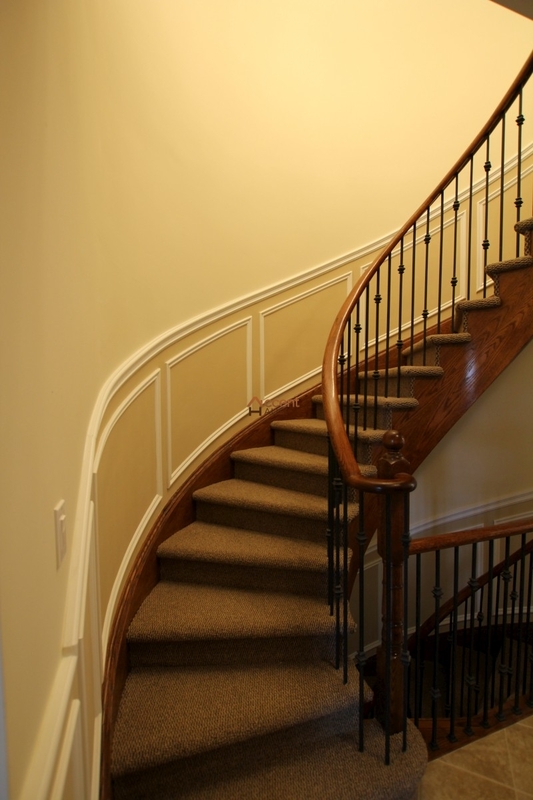 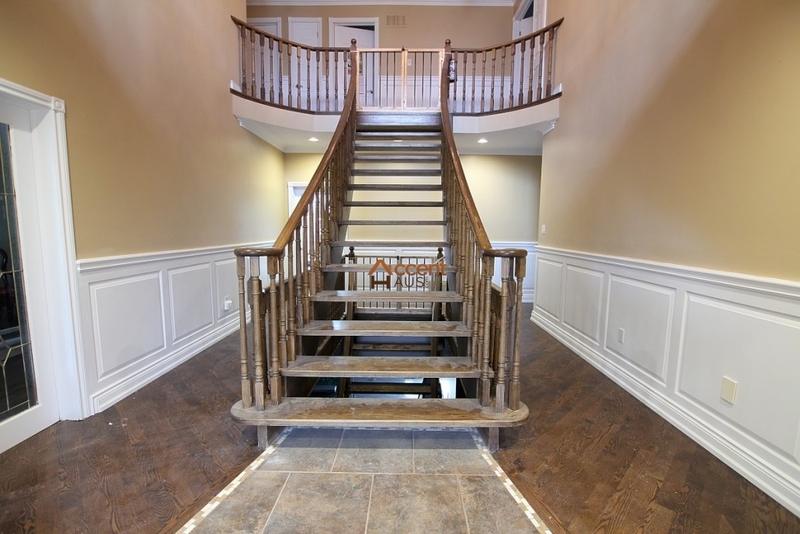 The overall design of the wainscoting will depend on your staircase. 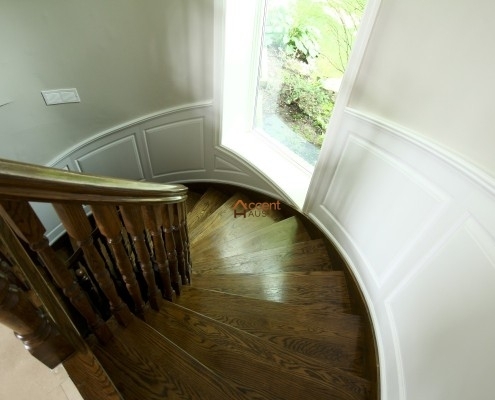 A design that looks fantastic on curved staircase wainscoting may not work as well on a straight staircase. 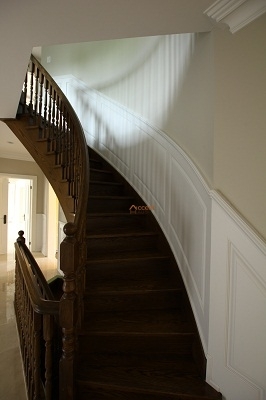 Likewise a design for a circular staircase will need some adjustment to work on a curved staircase. No matter the layout of the staircases in your home, our design team can work with you to choose the best style for your space to achieve the look that you desire. 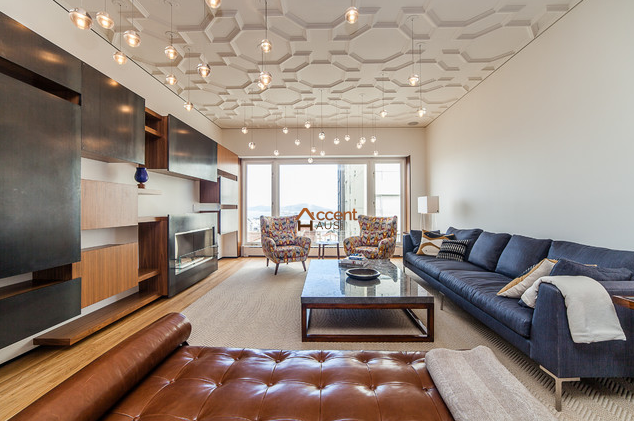 Ceilings are the single largest expanse of space in any room of the home. 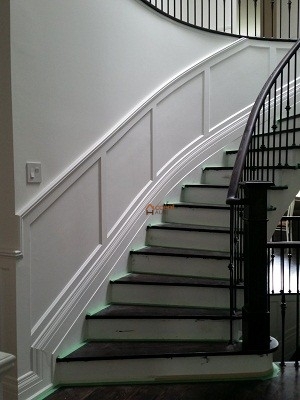 They are often the most overlooked being left the flat white they are originally painted with. 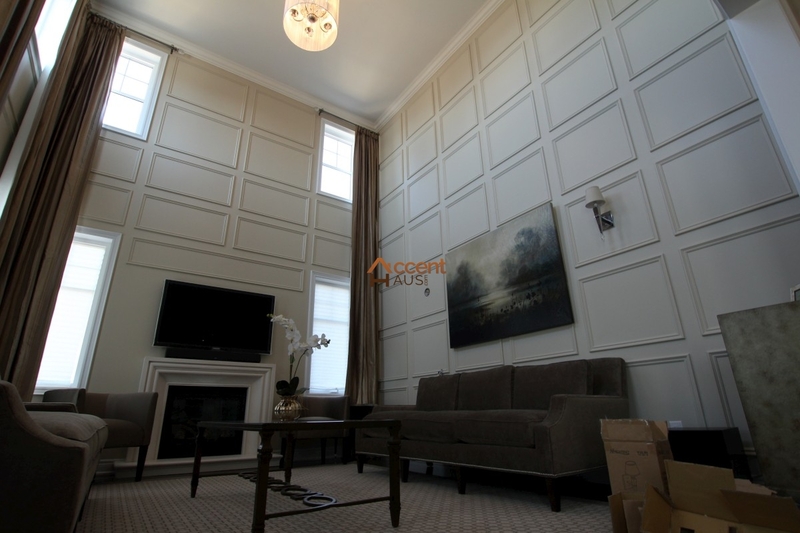 Installing wainscoting on the ceiling can transform the look of the entire room by adding dimension and depth to the space. 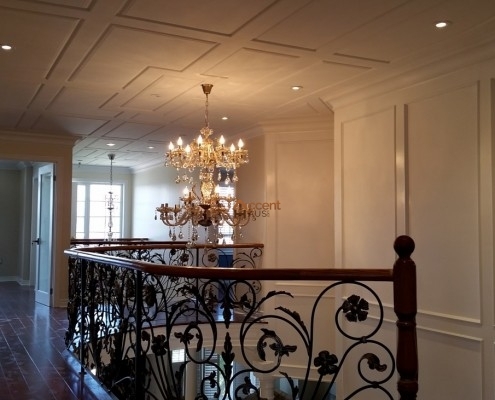 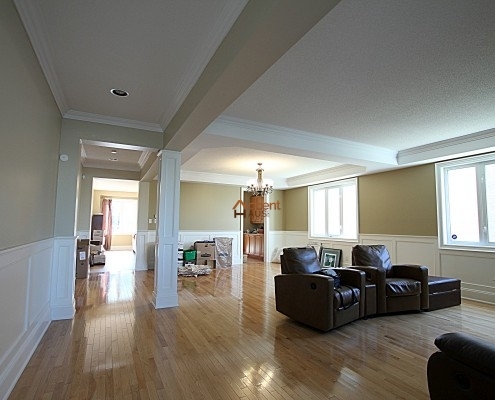 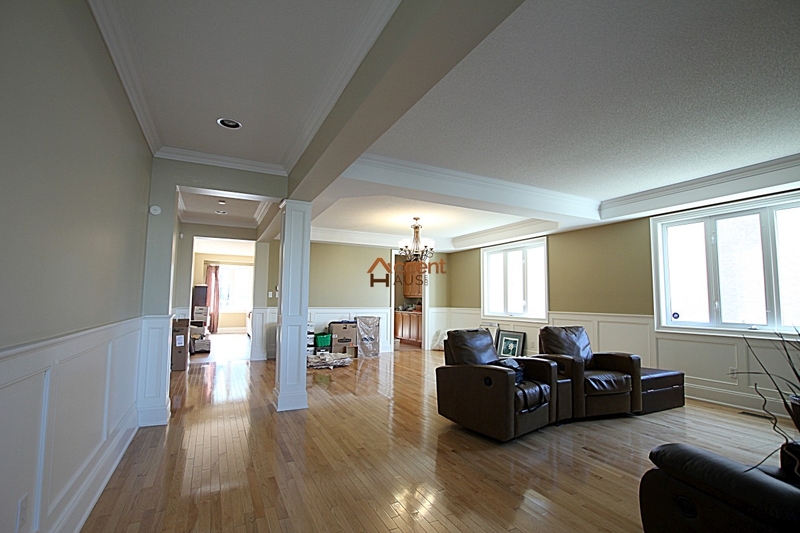 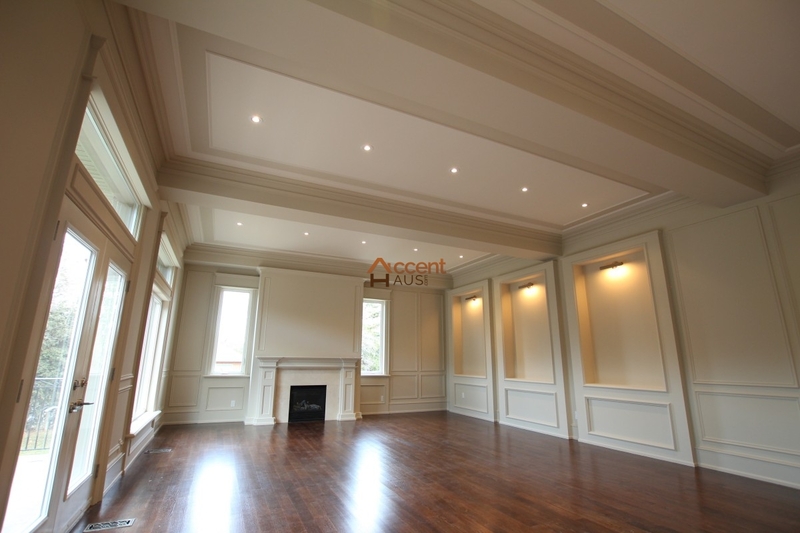 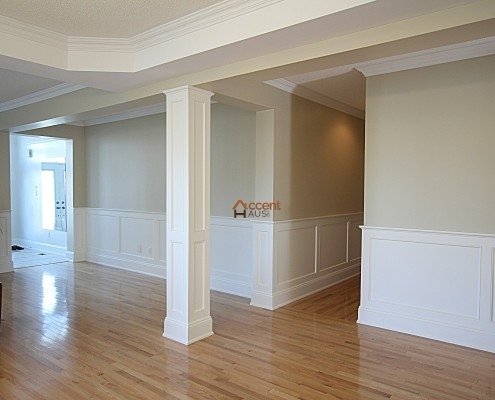 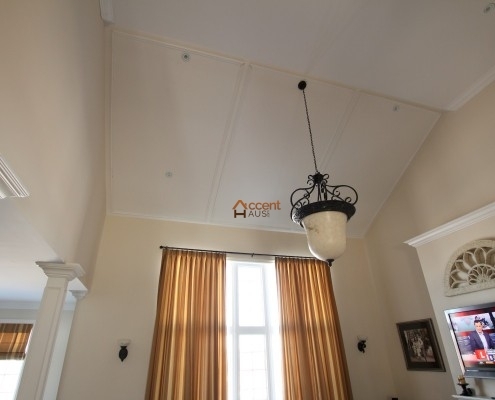 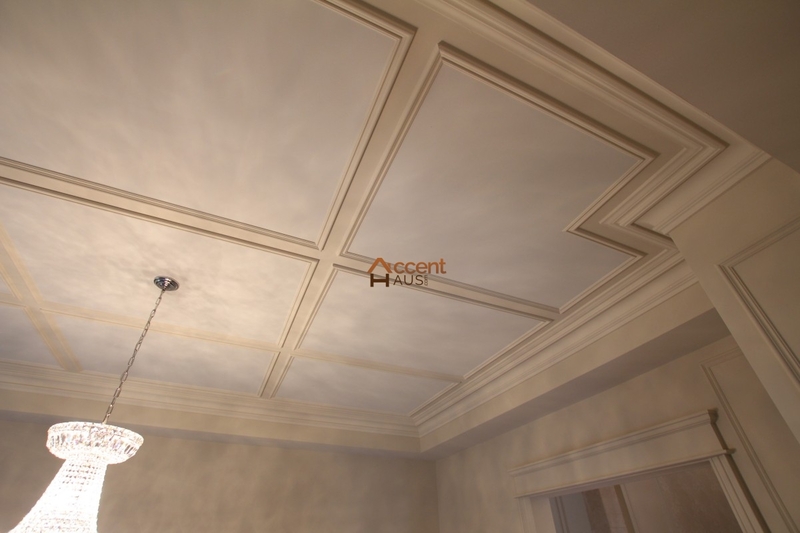 Our wainscoting designs can provide an excellent look for your home’s ceilings. 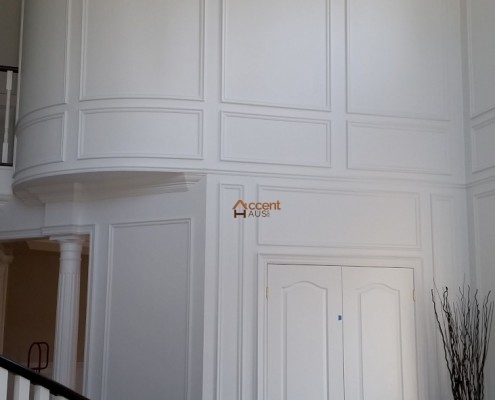 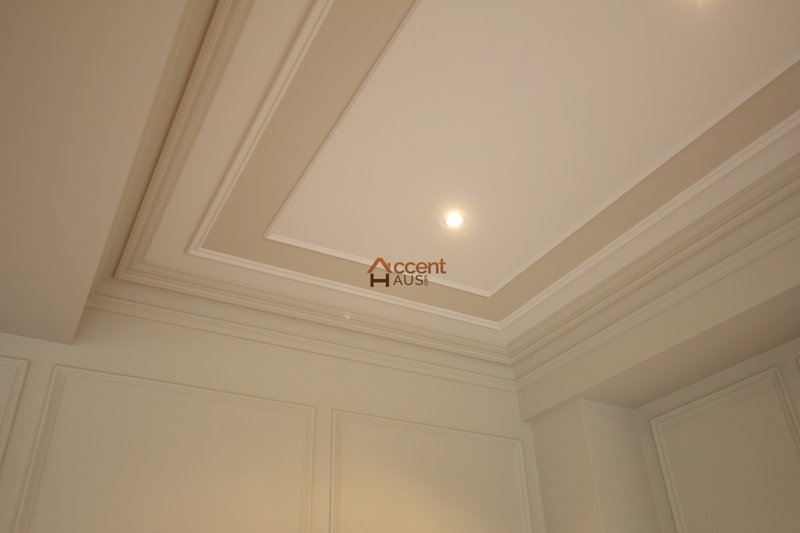 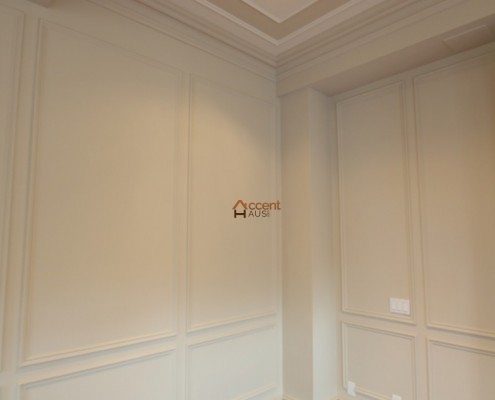 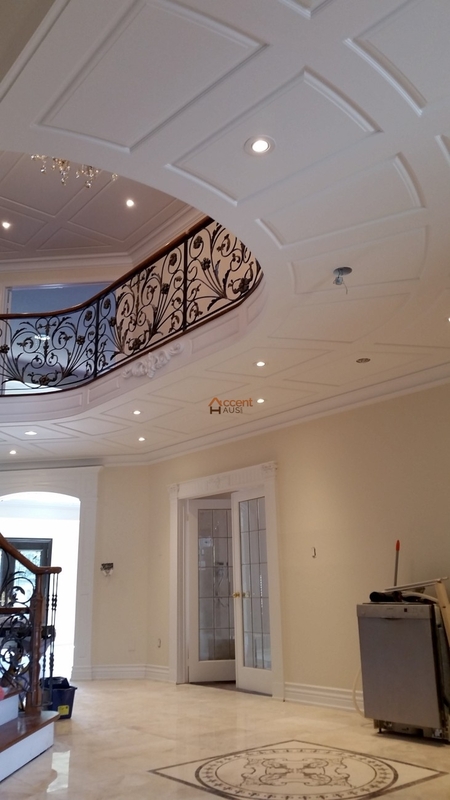 Nearly any type of wainscoting that can be used on walls can be used on the ceiling as well, we ensure elegant mixture of color and design to your ceiling decoration. 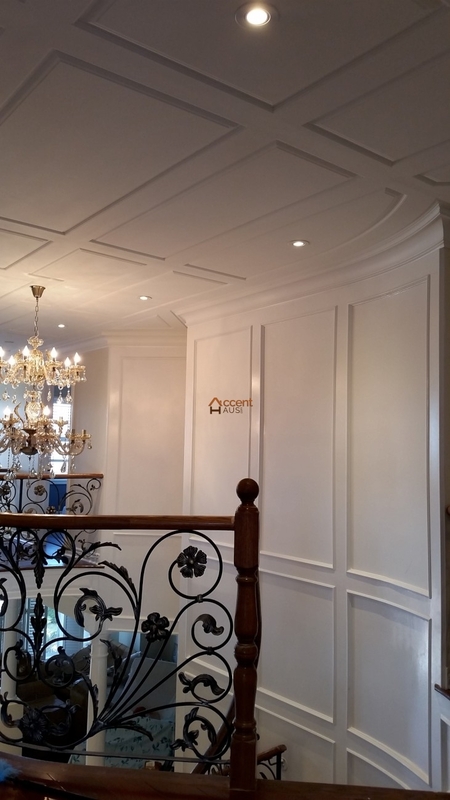 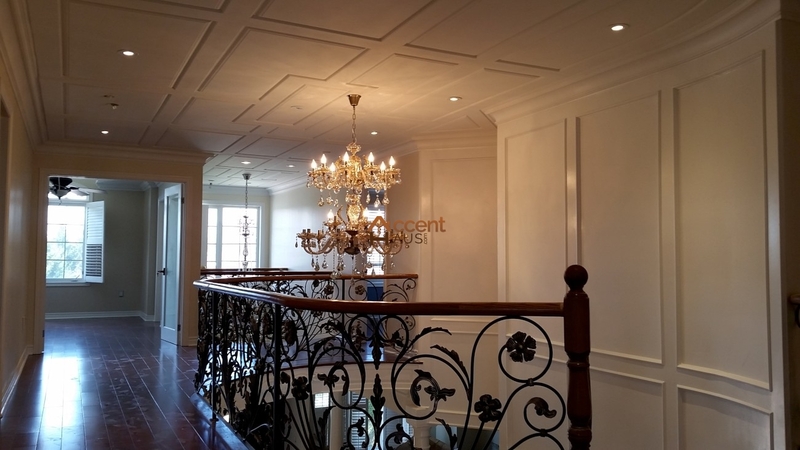 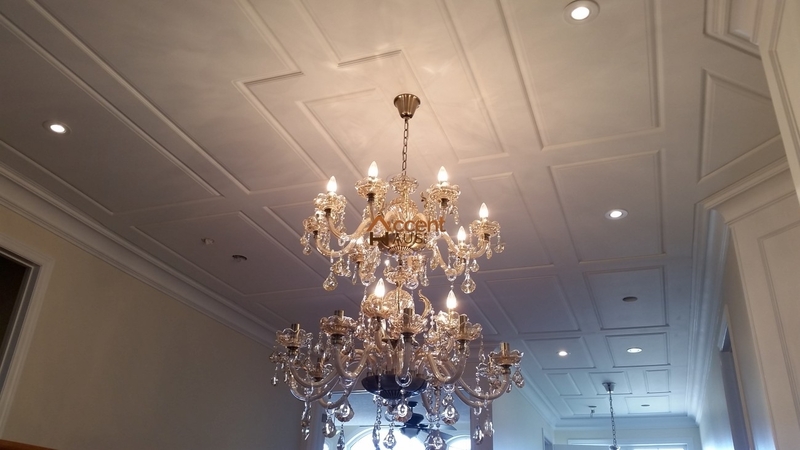 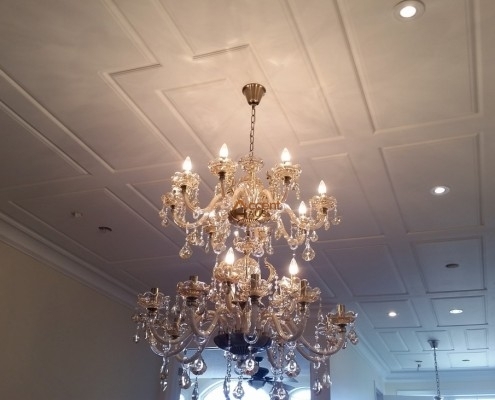 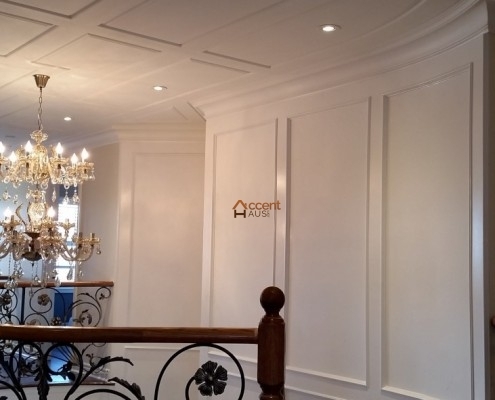 Our team of professionals will assist you to make your ceiling more attractive by combining modern technologies and selecting perfect wainscoting style for your ceilings. 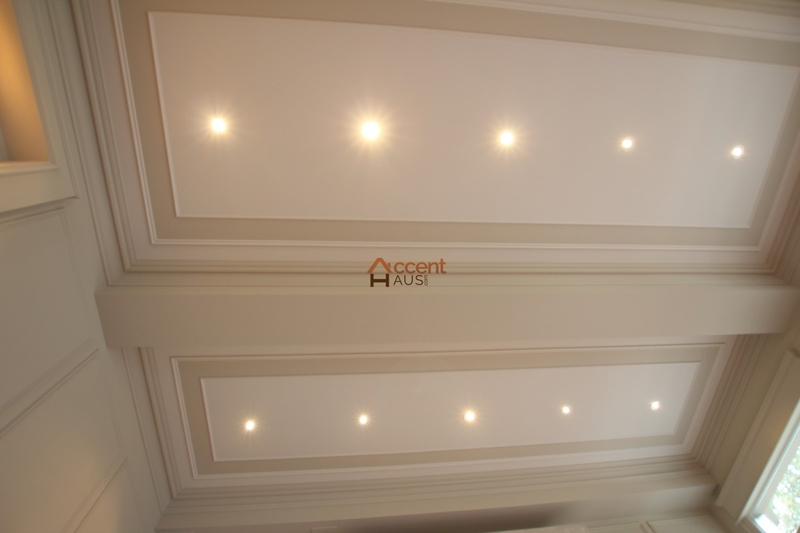 We can turn a plain ceiling into the focal point of your home with creative design ideas. 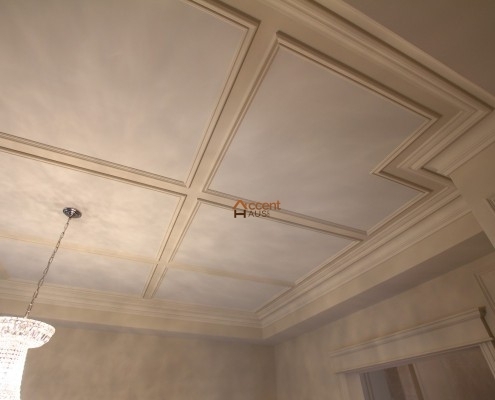 Our professionals can remodel an entire room simply by sprucing up your ceiling. 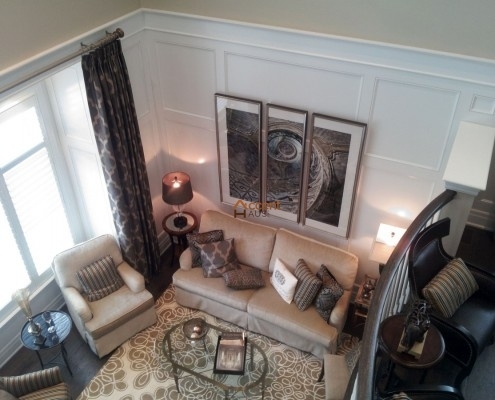 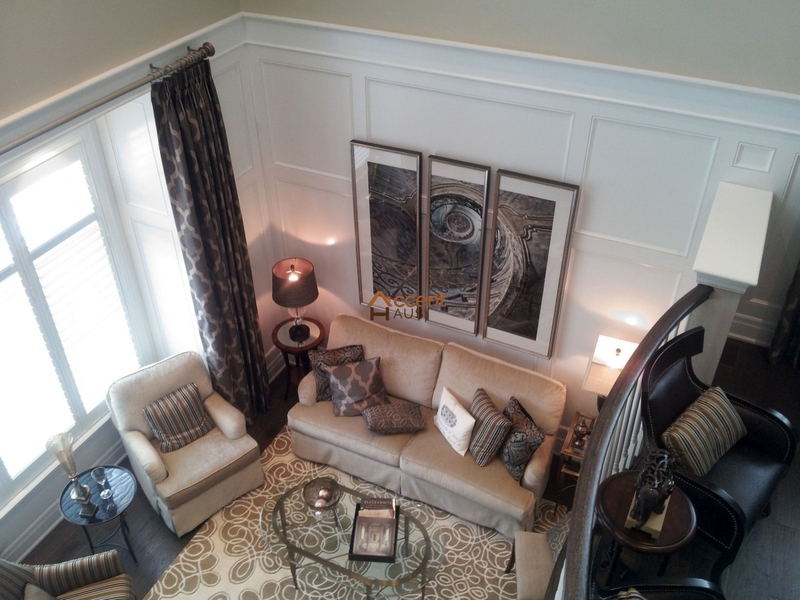 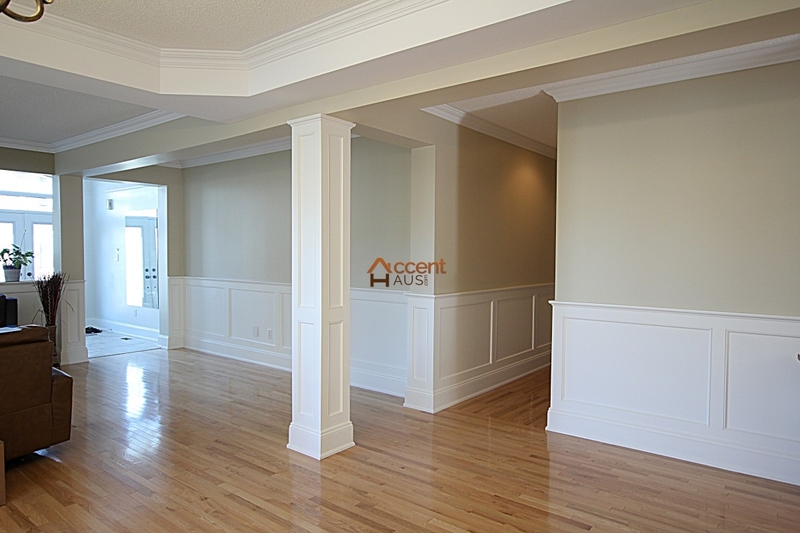 Our several design patterns will help you to choose perfect wainscoting style. 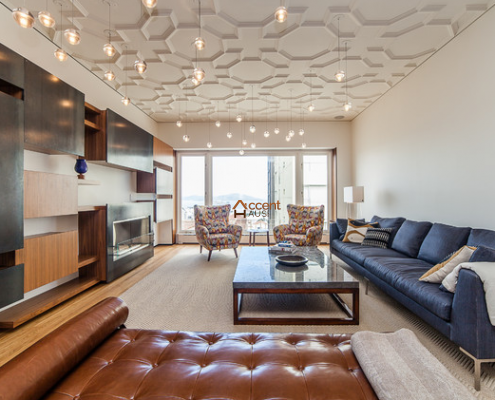 These decorations provide a textured effect that adds visual interest to the ceiling. 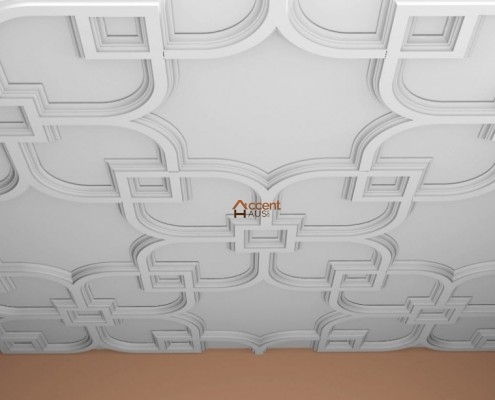 The most common choices include wood, MDF, plywood paneling, stamped-metal ceiling panels, tongue-and-groove board paneling along with various wallcovering designs. 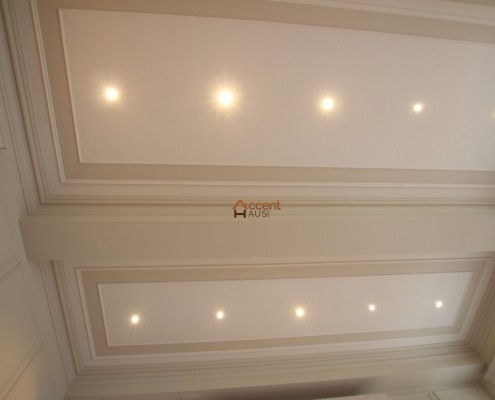 Lighting arrangements are greatly popular nowadays and can be utilized as a part of ceiling wainscoting decoration for your home. 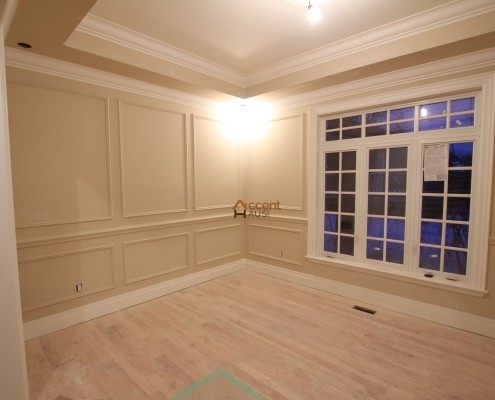 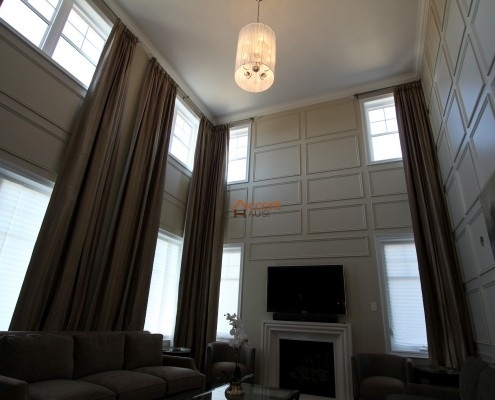 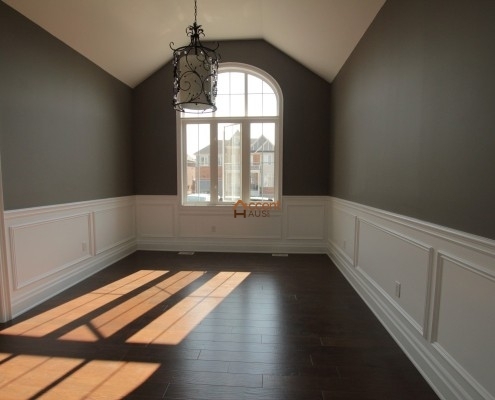 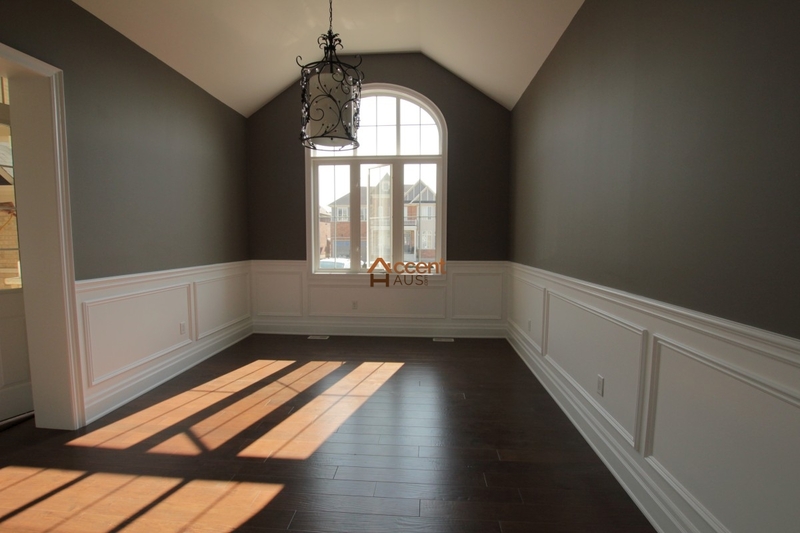 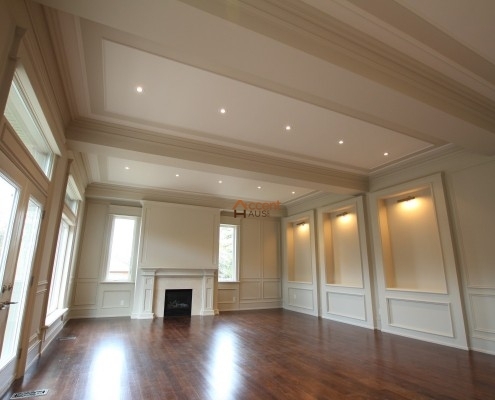 When it comes to enhancing your ceiling we are offering a variety of ceiling wainscoting styles. 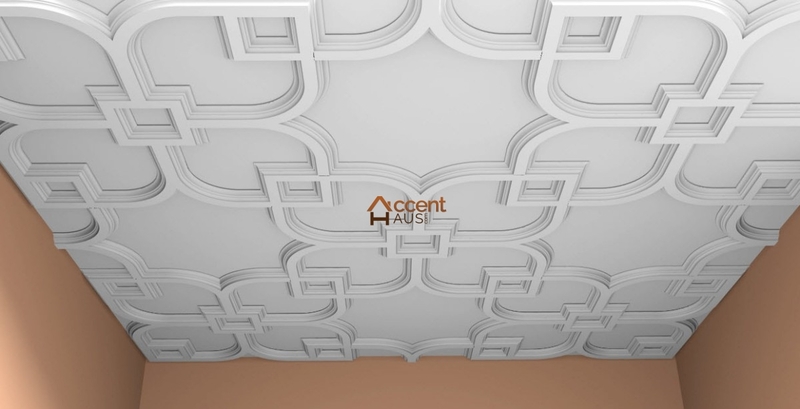 Ceiling decorations can add so much character to the style of your home; be it your dining room, kitchen, family room or any room at your home. 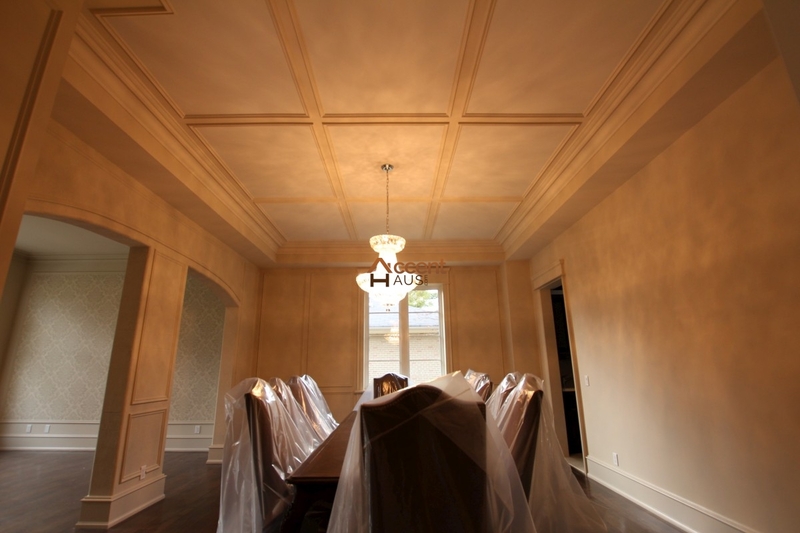 Our expert professionals can help you achieve the completed look and feel you desire to create. 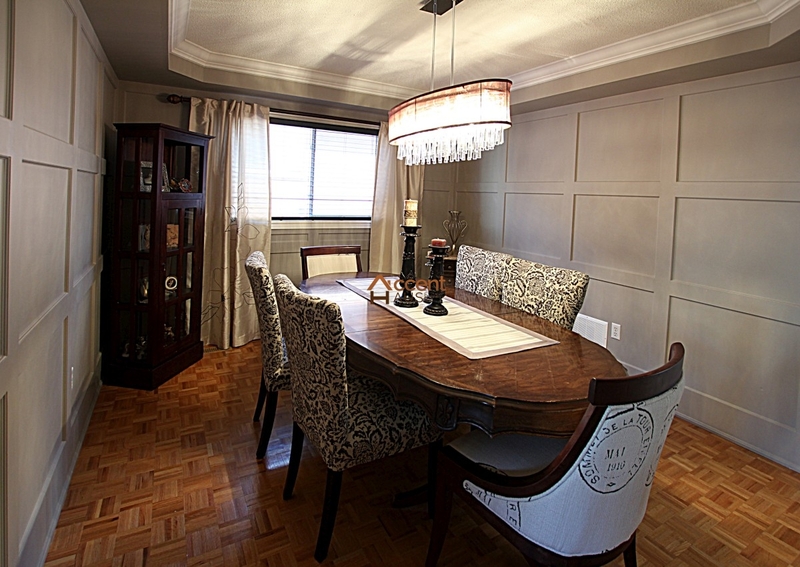 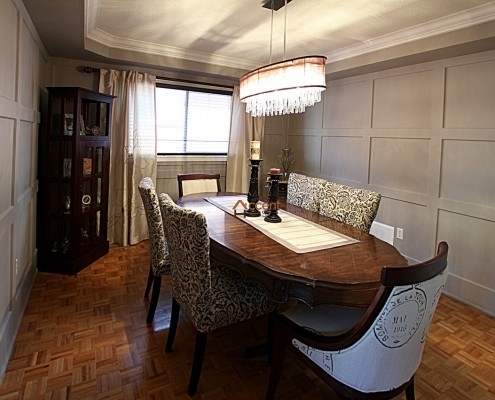 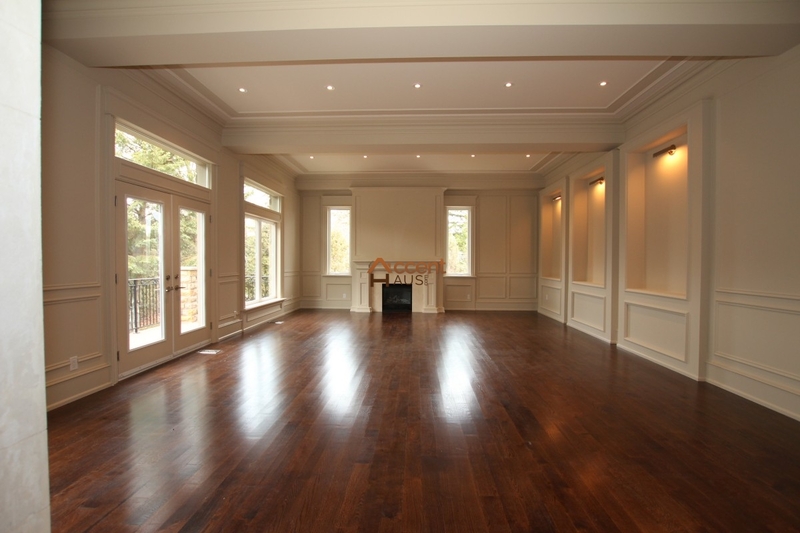 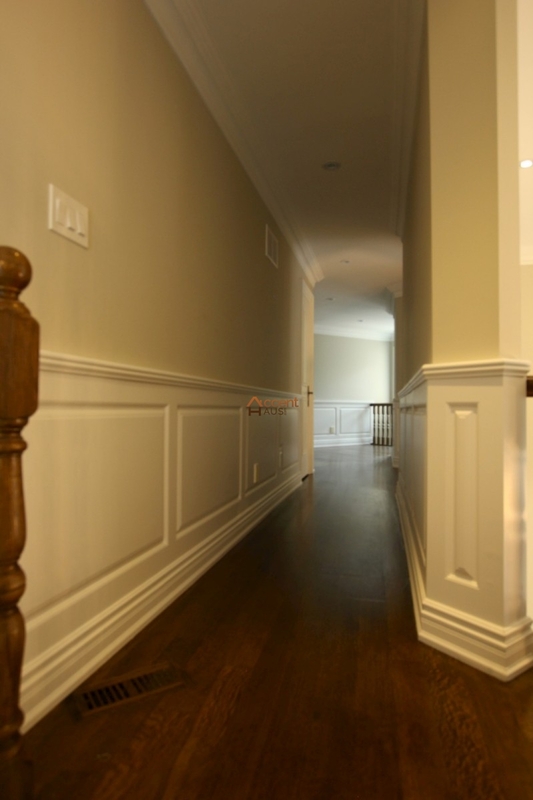 In the hundreds of years that wainscoting has been around, a number of styles have emerged. 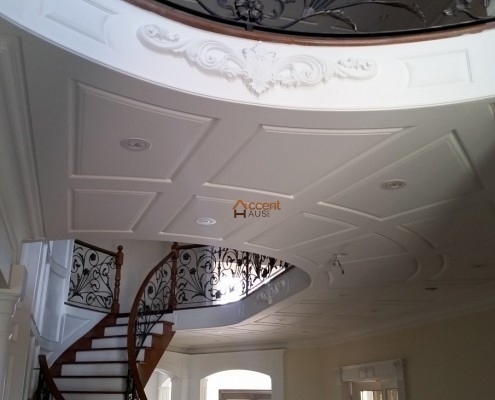 While you could classify these styles into dozens of categories, three really stand out above the rest in both popularity and overall aesthetic design. 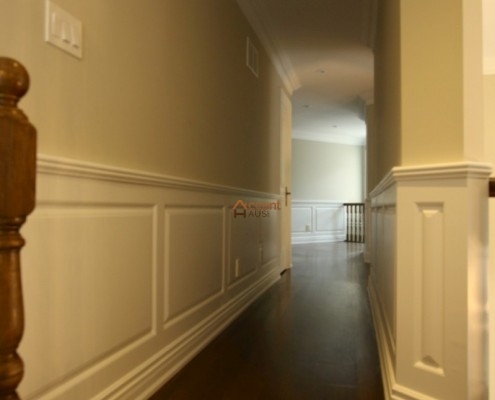 Raised panels are the classic design that most people think of when it comes to wainscoting. 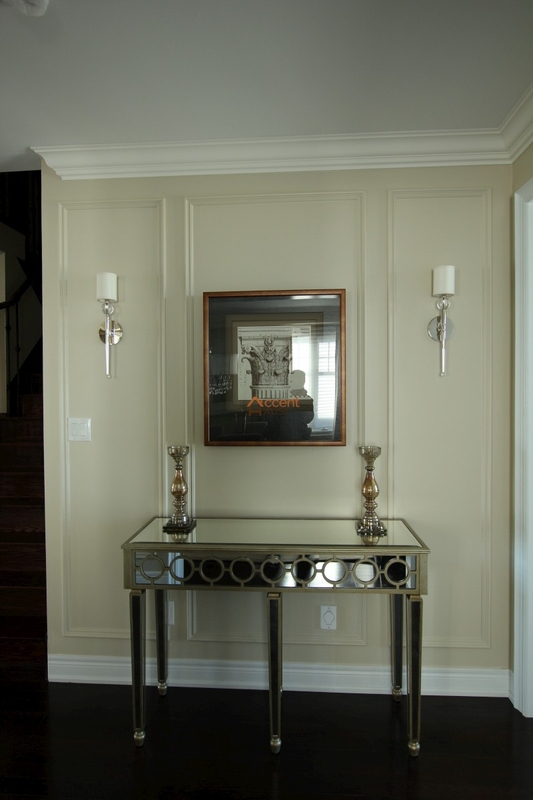 The design features uniform square panels that appear to rise from the wall. 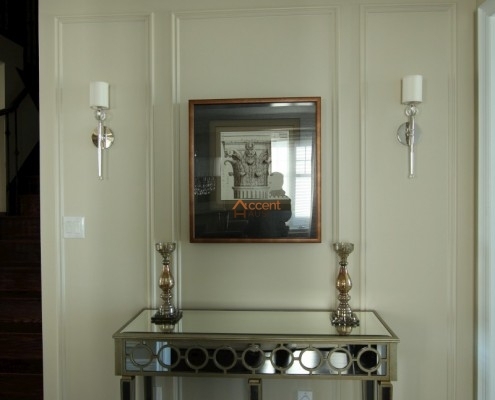 Each panel is set within a frame of which the thickness can vary. 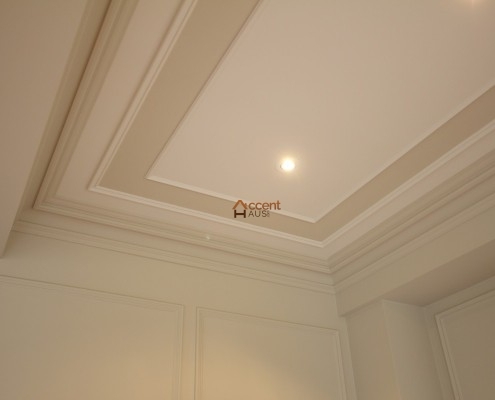 It provides very clean, elegant, classic look. 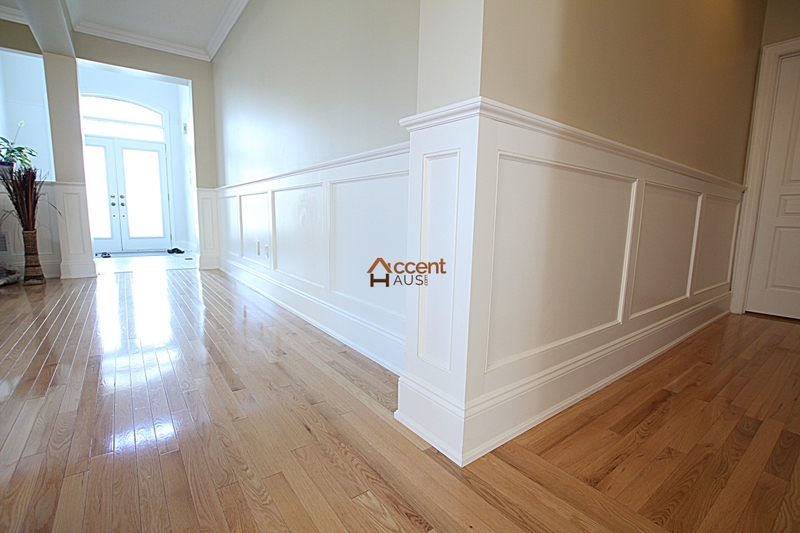 Shaker style wainscoting has its origins in the 19th century, but became popular in craftsman homes during the early 20th century. Like other items from the shaker movement, this wainscoting provides a very simple look. 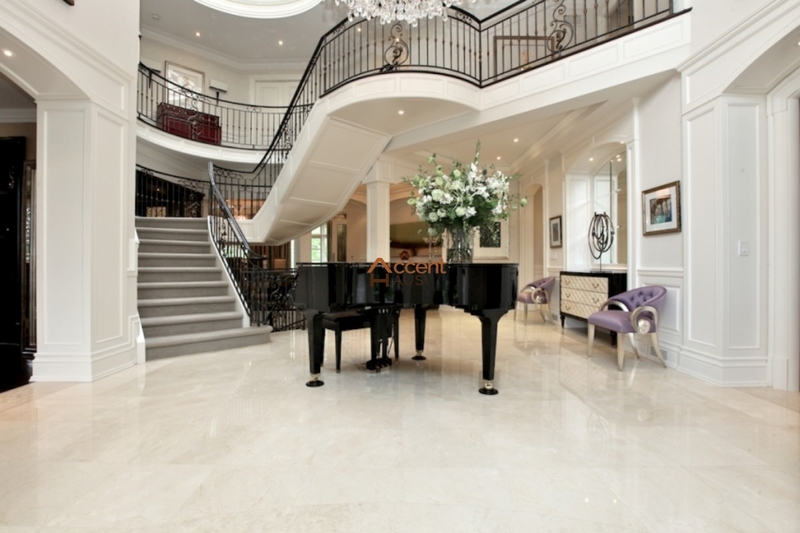 It passes on the ornate elements for strong, clean lines. Recessed flat panel and wall panel wainscoting provides a modern look, giving the appearance that the panels are recessed into the wall. 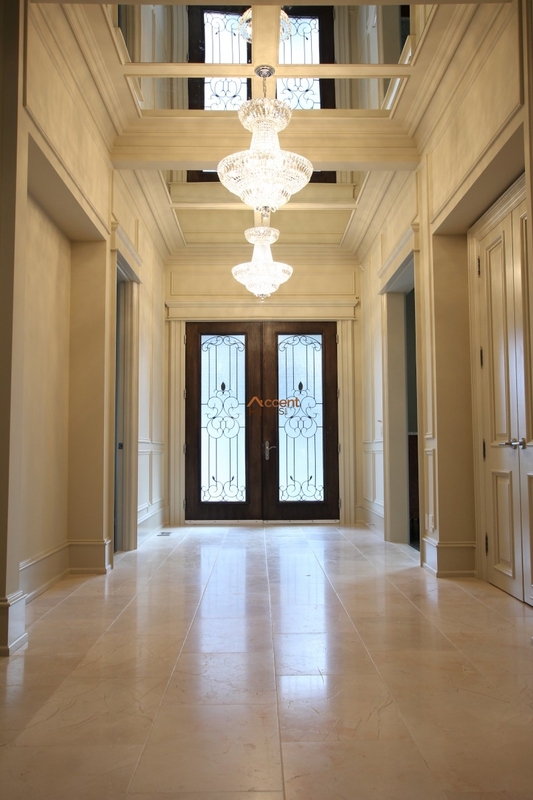 The overall style can vary greatly depending on the style of molding used. 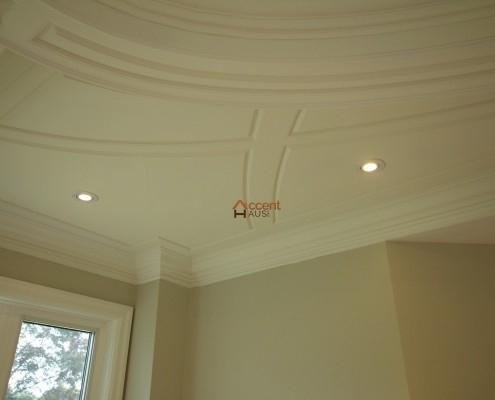 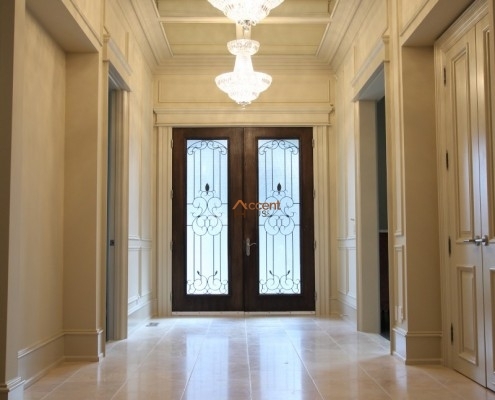 Wide, straight molding can be used for clean lines while a more ornate trim can give a very elegant look. 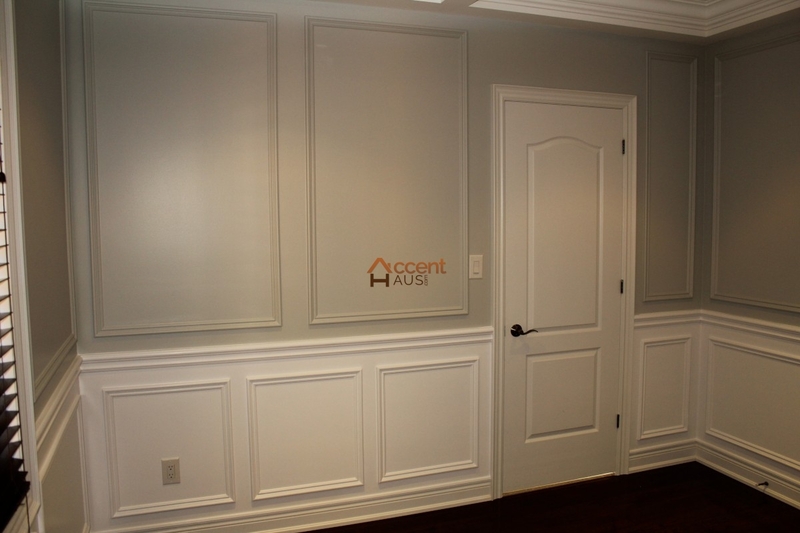 Our Raised panel, Classic raised panel, Recessed, beadboard and Shaker wainscoting panels are designed with the most recent innovation that makes excellent look with perfect corners. 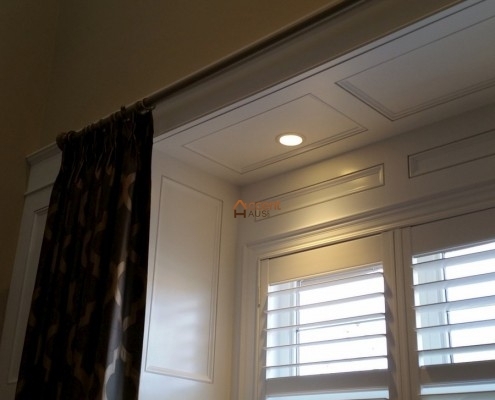 Any style can be dressed up or down depending on the trim that is used. Wainscoting with trim that is ornate will look very elegant while simple trim gives a very clean look. 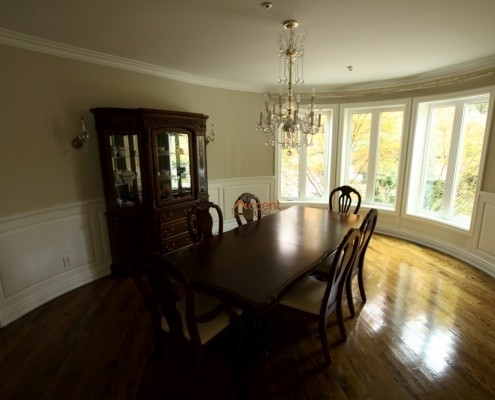 Wainscoting decoration can also include classic moldings to provide a classical feel. 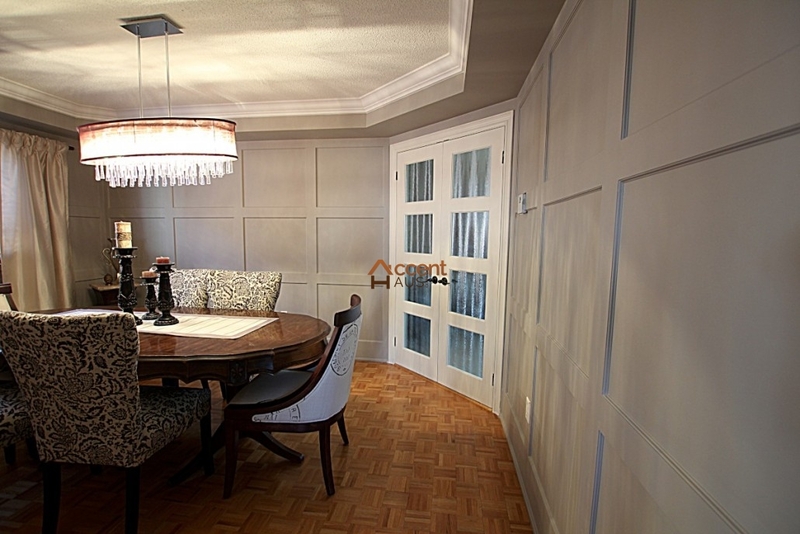 Practically any style can be customized to fit the look of your space. 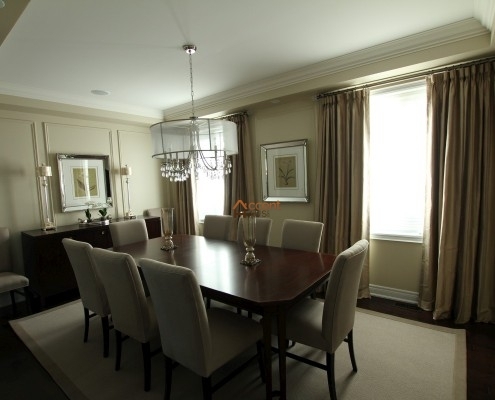 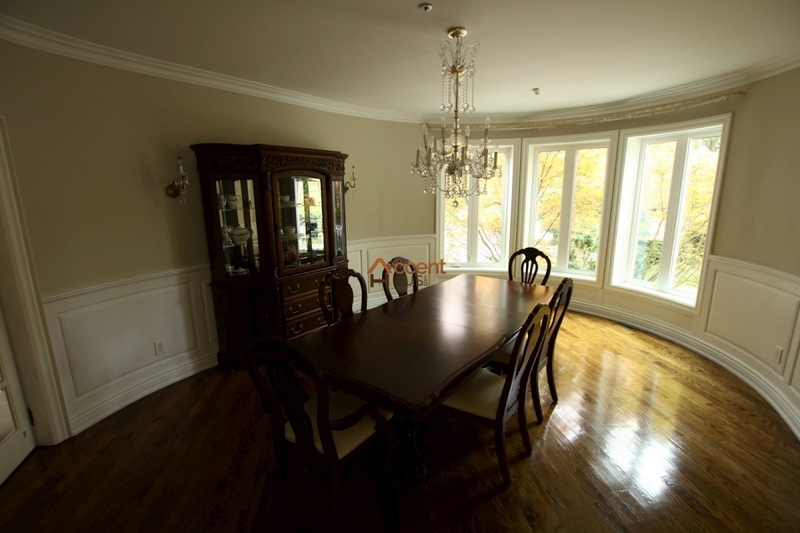 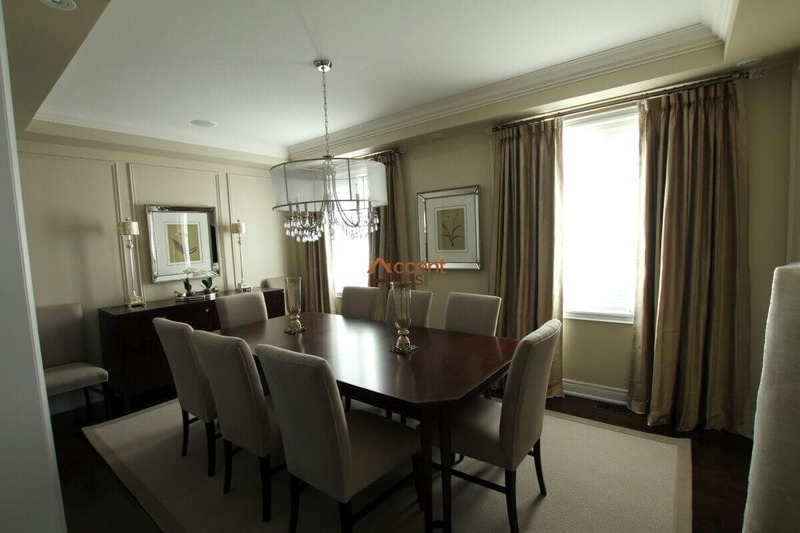 We can customize designs to fit any room such as dining room, living or family rooms of your home. 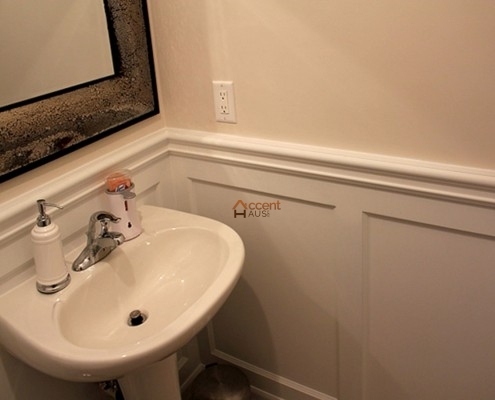 Nowadays our wainscoting styles are getting popular and add a great expansion with latest design ideas. 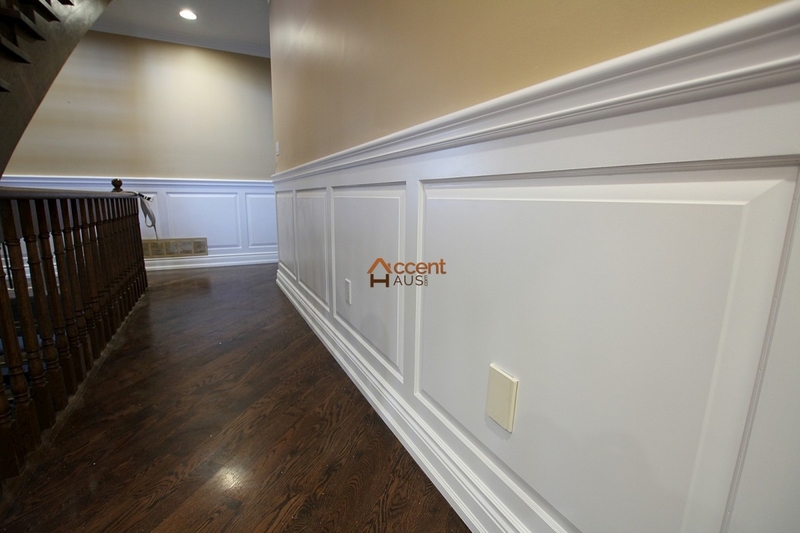 Applique Wainscoting is a beautiful solution for areas where traditional paneling would be impractical or awkward. 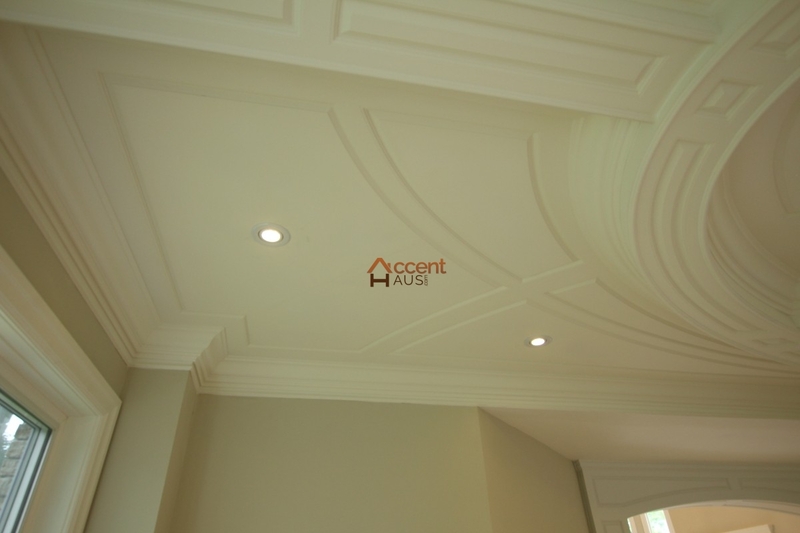 It’s flexibility allows for more elaborate designs that easily fit with modern interior decoration. 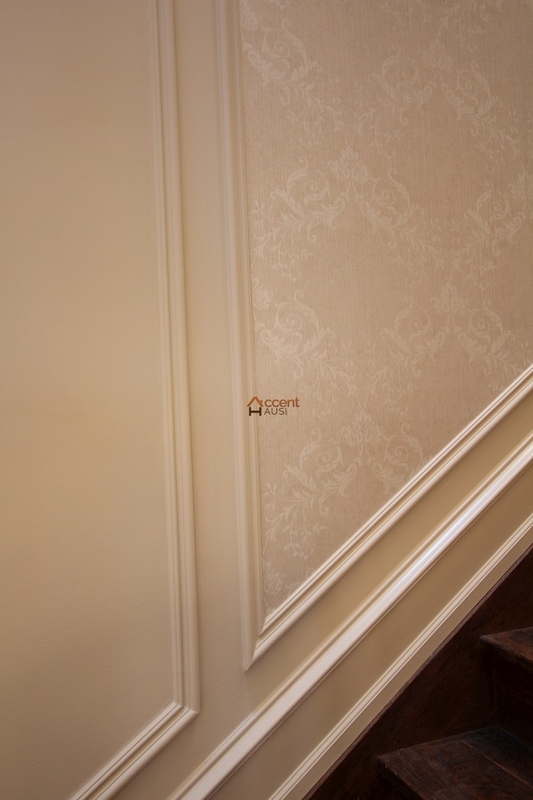 Our appliqué wainscoting for walls utilizes standard decoration while offering enriching wall panel designs for your home. From traditional to modern styles appliqué wainscoting interiors perfectly match contemporary styles to offer a charming arrangement in your decoration. Applique Wainscoting is designed to look very similar to the classic frame and panel styles, but is a more cost effective solution. 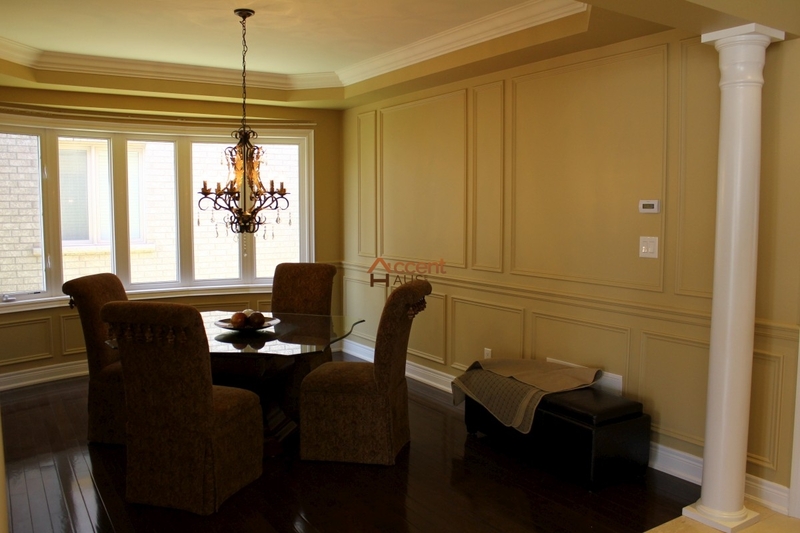 Rather than building individual frames, the panels and moulding are attached to your existing wall surfaces. 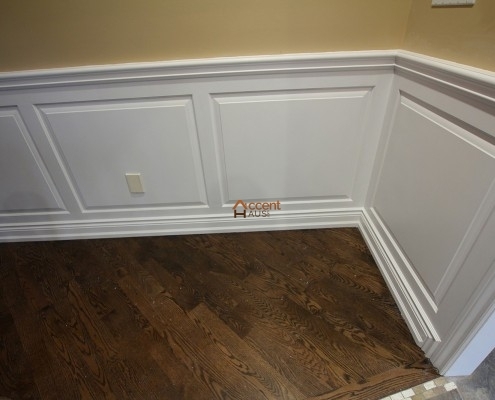 A chair rail is added above and baseboards are added below, finishing the look. This style of wainscoting, while relatively simple, gives a unique look to any room. 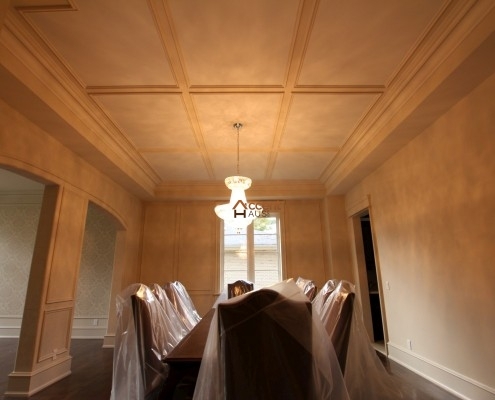 Our team of professionals will provide highest efforts, excellent work and quality installation materials. 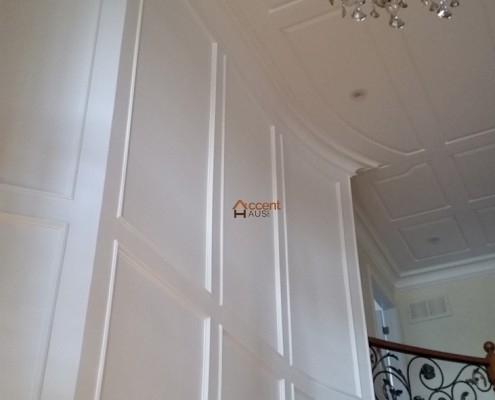 Our appliqué wainscoting decoration always ensures latest design ideas with offering ornamental appearance of your home. 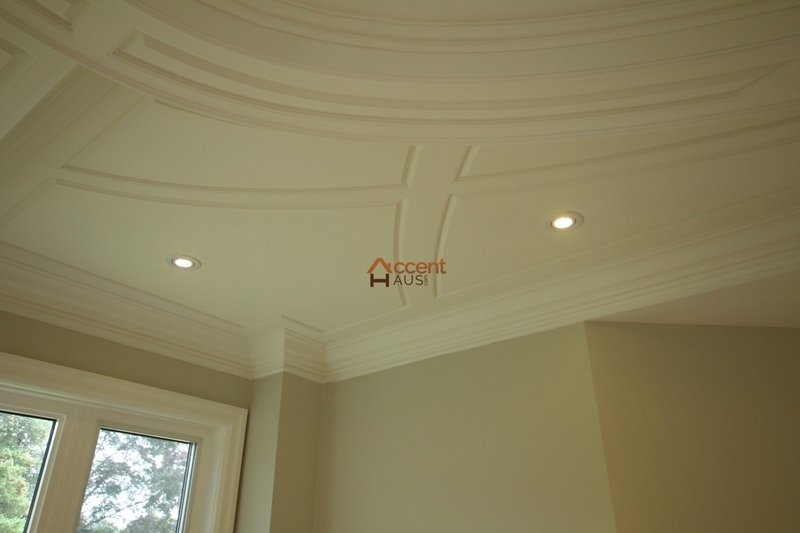 We offer dozens of moulding options. 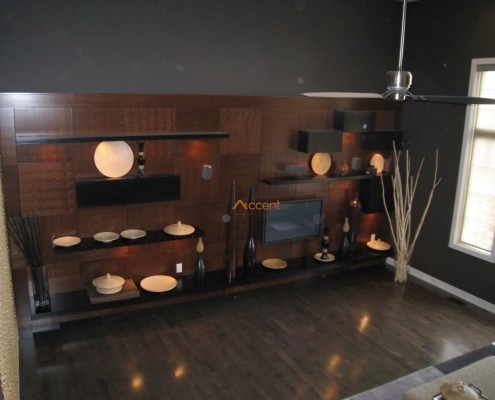 These can be combined in any fashion to fit existing design within your home or to fulfill any creative design vision. 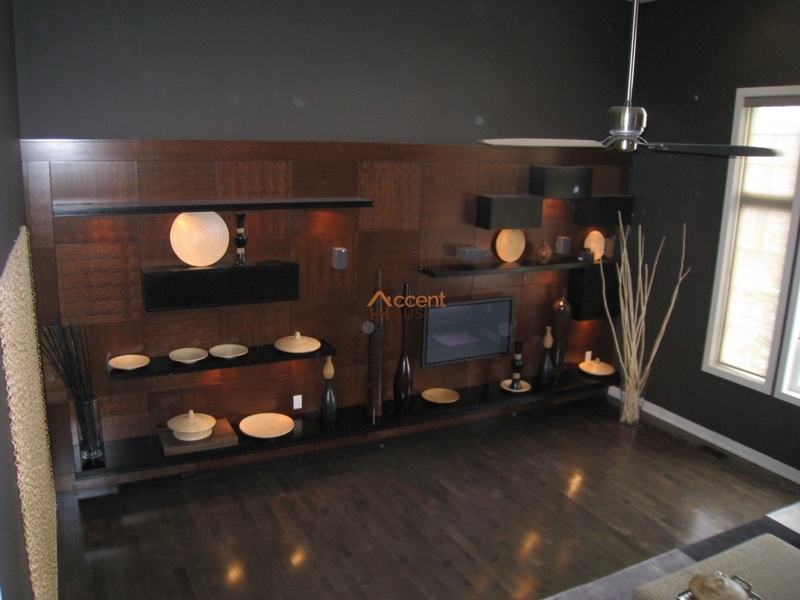 This array of options provides an endless design possibilities. 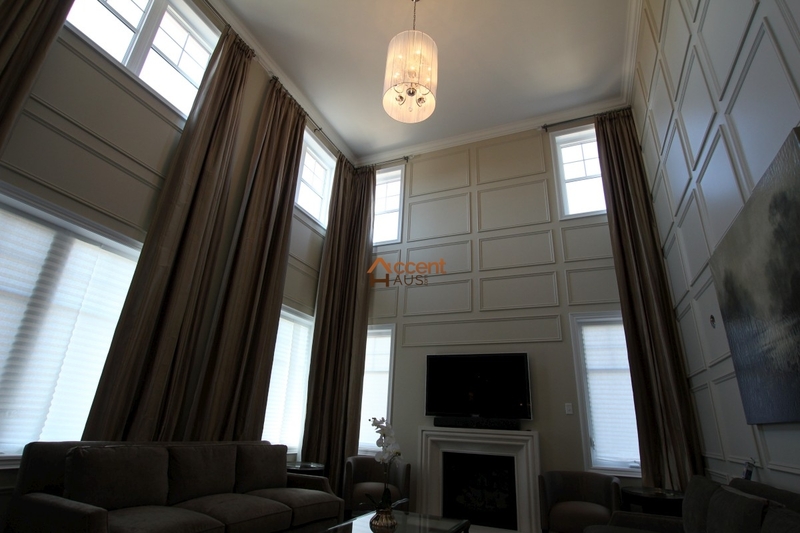 These are typically installed at 36″ to 42″, but can easily be extended to offset higher ceilings or to cover the entire wall. 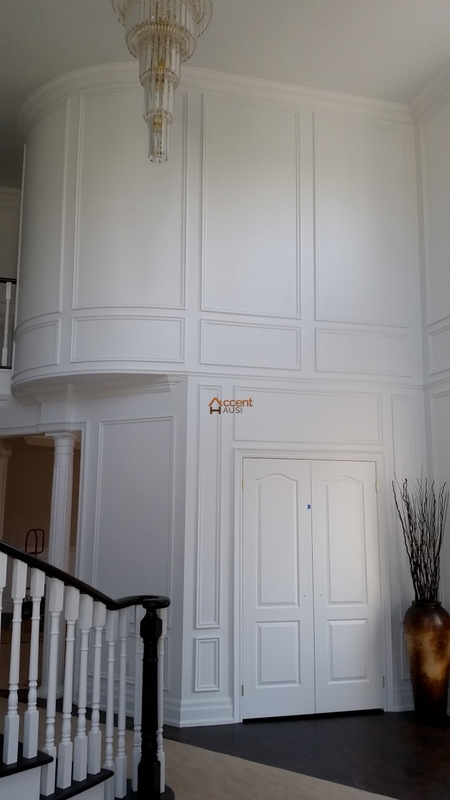 Covering additional area is much easier as frame and panel styles are difficult to build for tight or unusually shaped spaces. 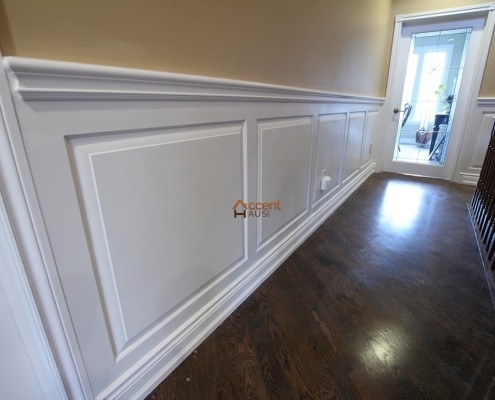 You can consider our appliqué wainscoting ideas when you are looking to redesign your home with classic styles. 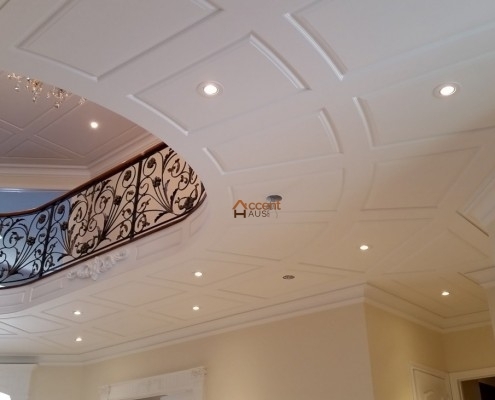 From our large collection of designs, you can choose your perfect style that can be cost effective and provide a gorgeous decoration of your home. 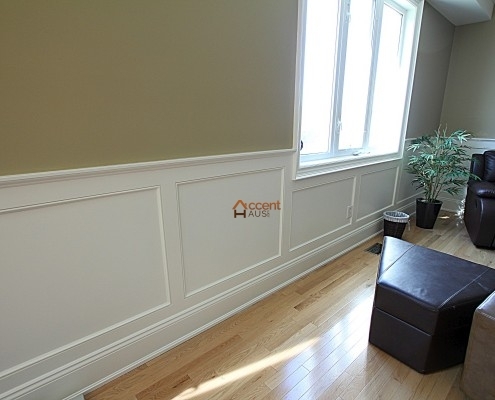 Our appliqué wainscoting designs can be available in different styles. 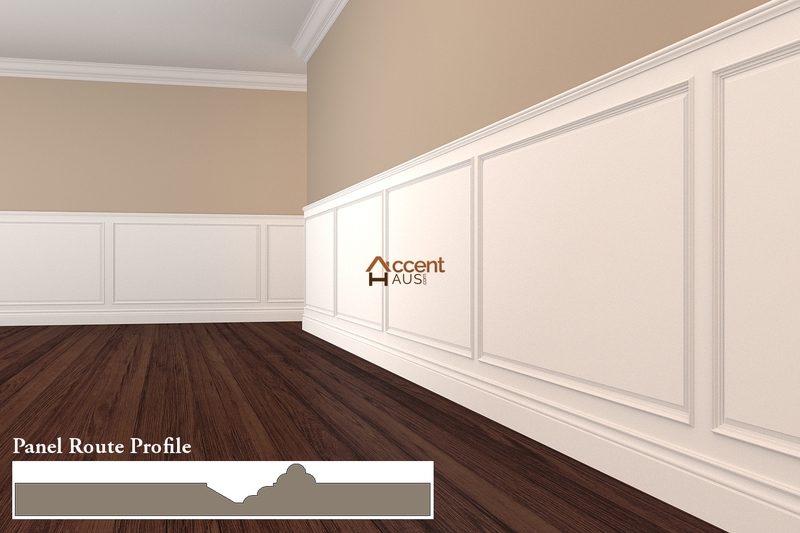 Applique wainscoting is available in practically any color and can be matched to your existing wall color. 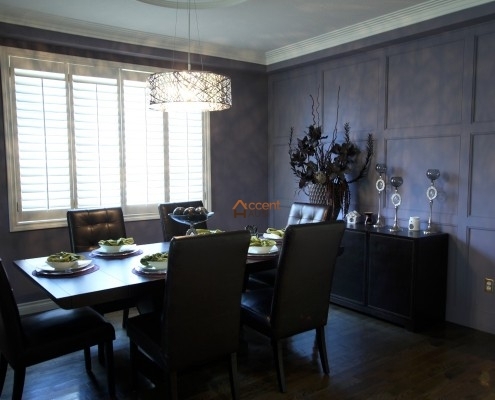 Likewise, contrasting color can be used to provide an entirely different look. 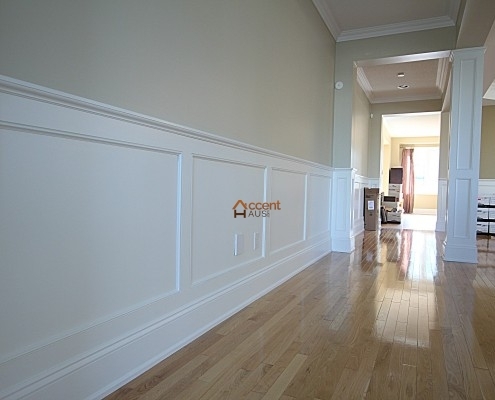 Applique wainscoting can be used to fulfill any design vision you may have. 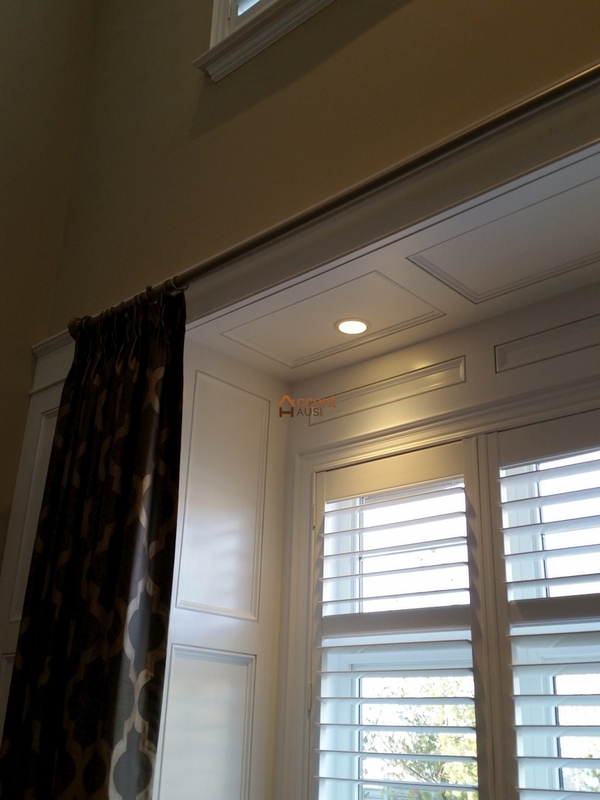 Our team of professionals are always available to assist. 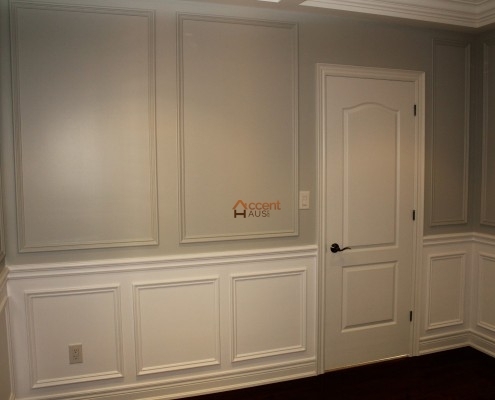 Let us show you how applique wainscoting can make your room look great while still being cost effective.